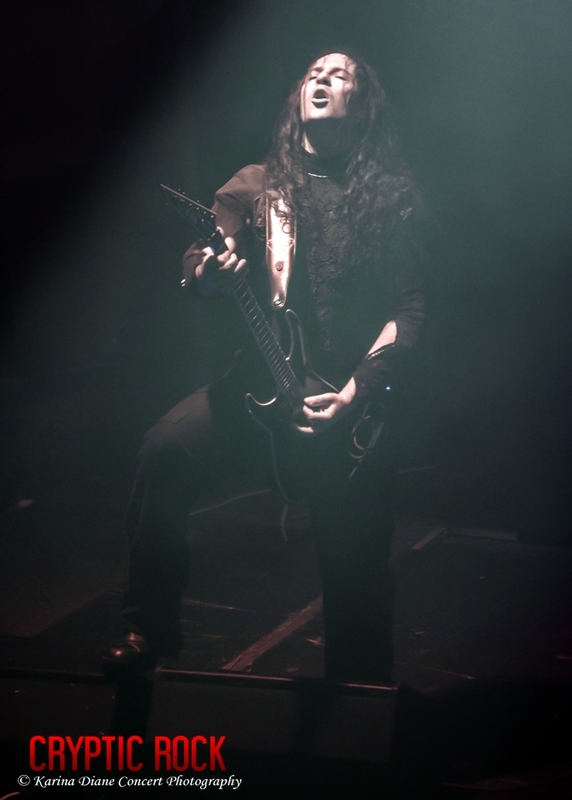 As far as Heavy Metal is concerned, it breathes its fire on the world whether you like it or not. 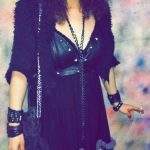 That in mind, there are some cultures and locations actually dominant in the acceptance of the genre. 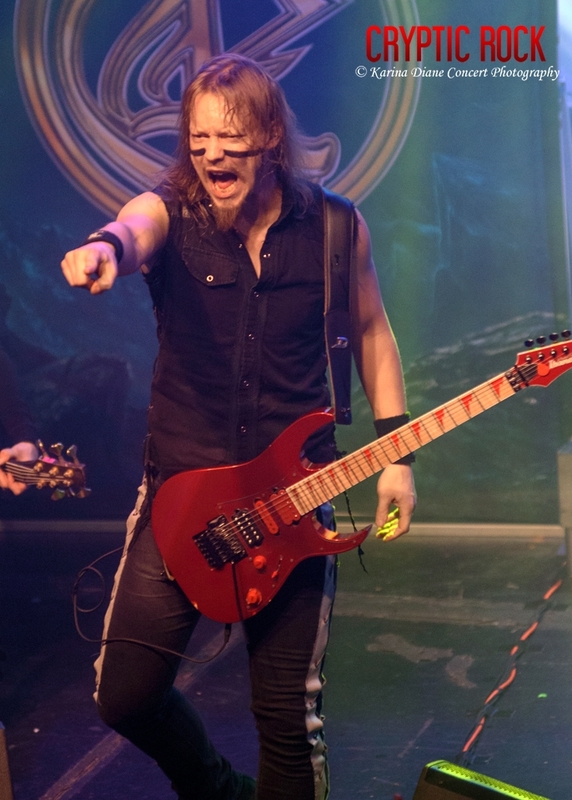 For example, Finland, a small country which happens to be a very Heavy Metal enchanted location that produces some of best bands, including Ensiferum. 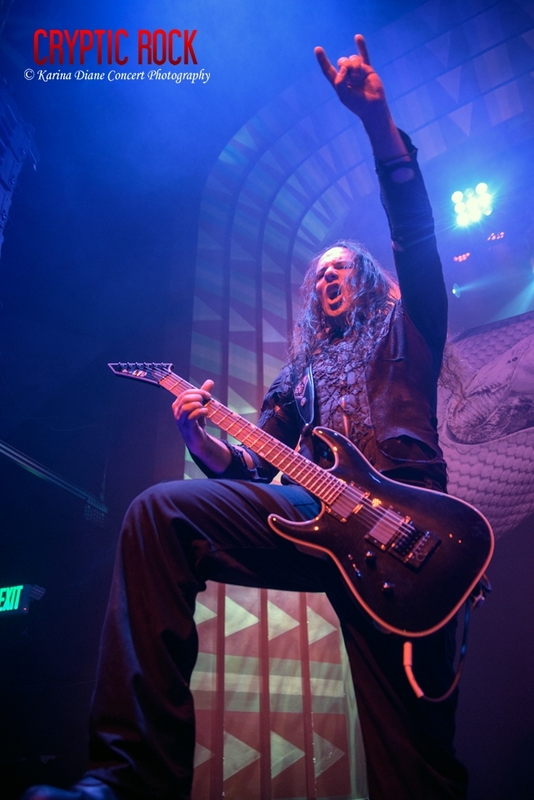 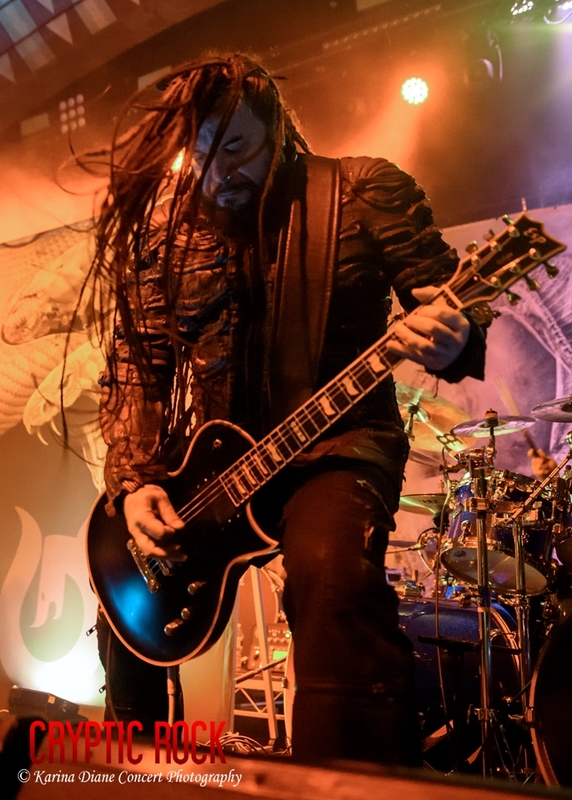 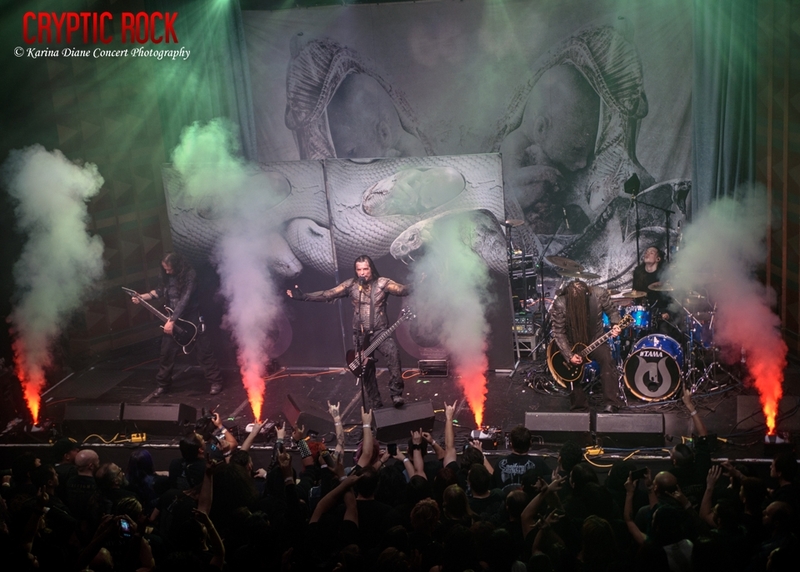 Always welcomed by American fans, on Monday, January 21st, the Folk Death Metal leaders brought their headlining tour to the Regent Theater in downtown Los Angeles with direct support from Septicflesh and Arsis. 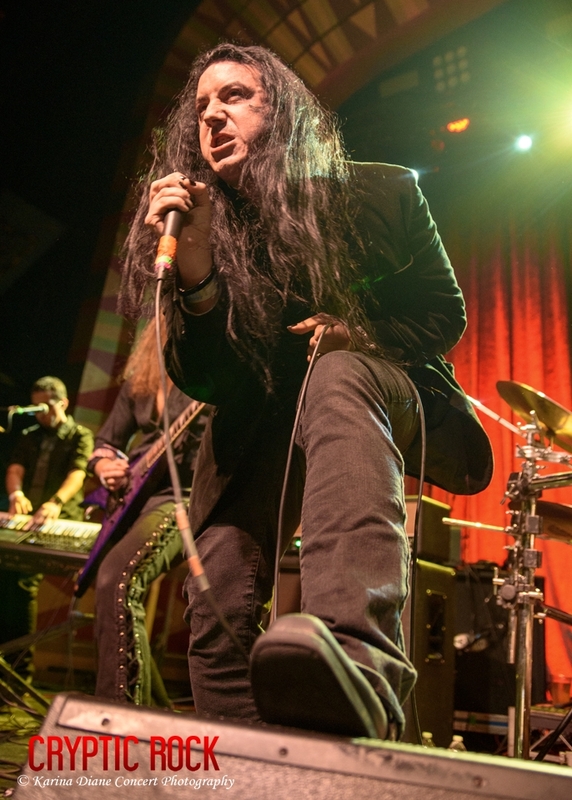 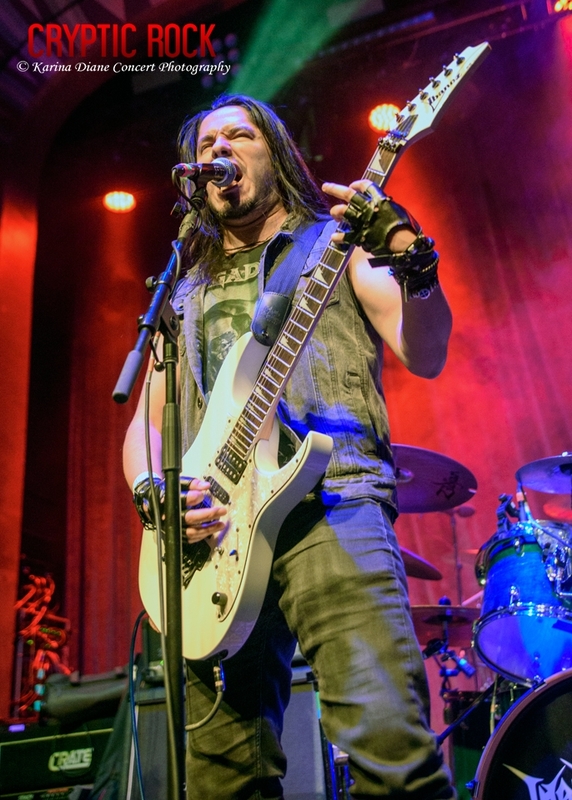 A show hosted by Church Of The 8th Day, that also included local openers Witherfall and Thorns Of Sin, it had an early start time of 6:30 PM, however, the fortune of it landing on the Martin Luther King Day holiday perhaps added to the already quickly filled up house. 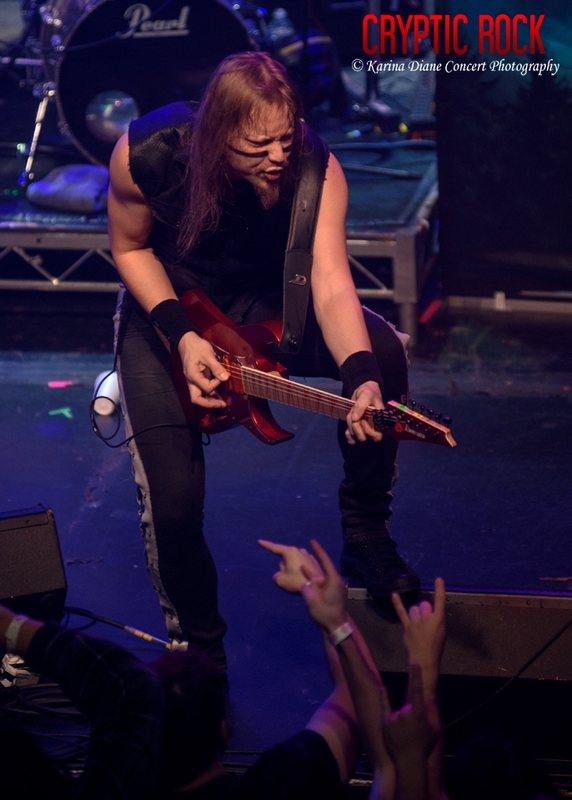 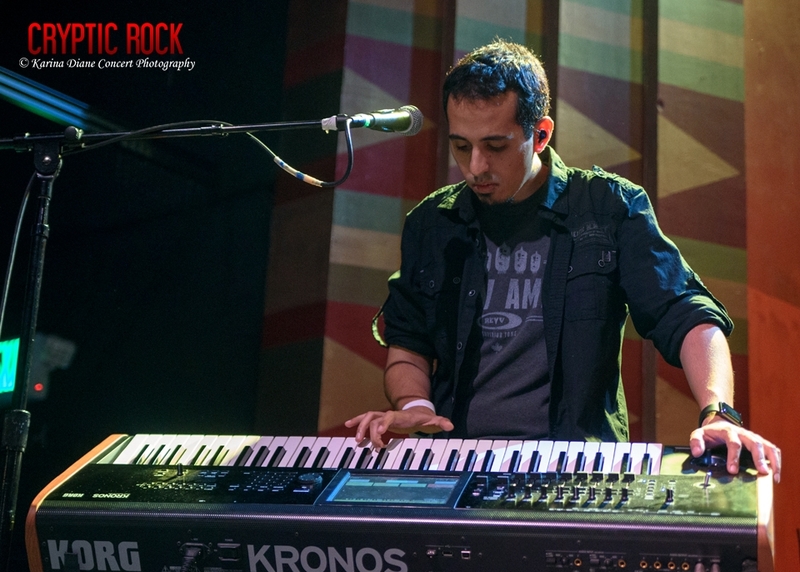 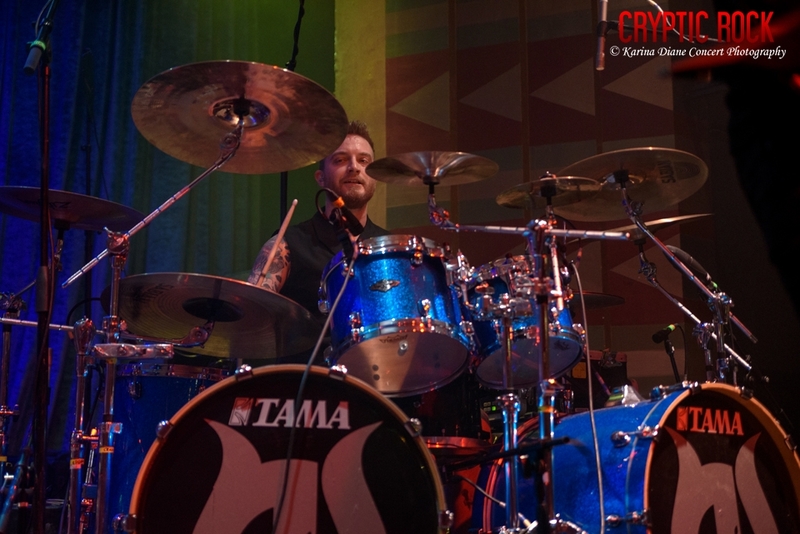 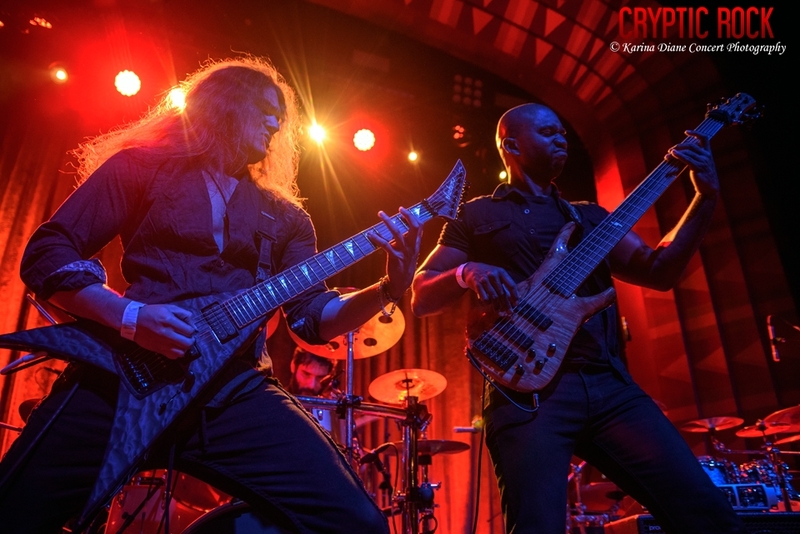 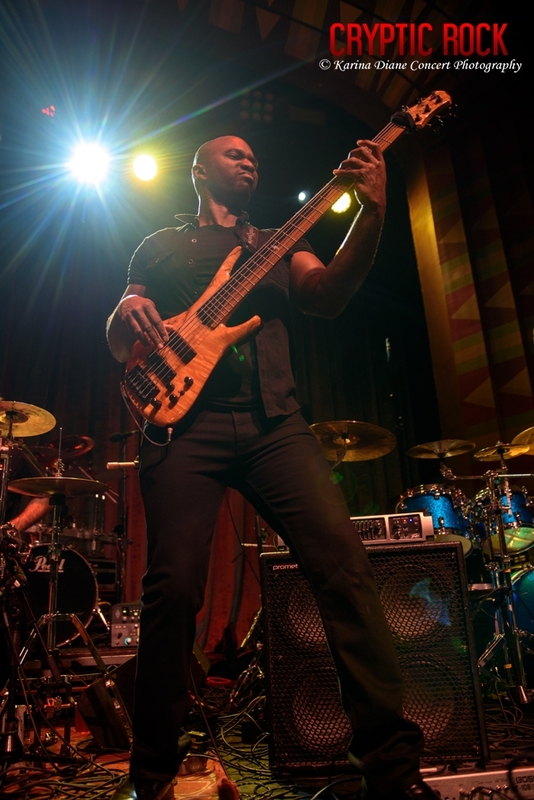 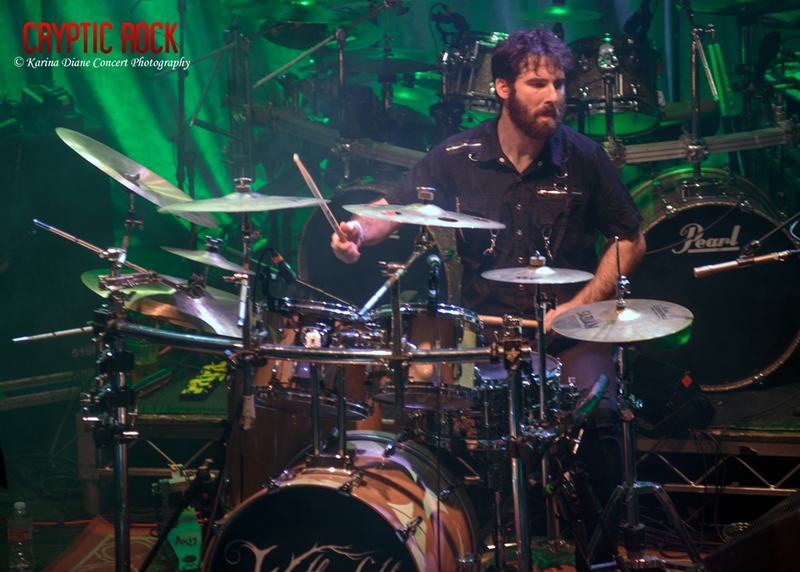 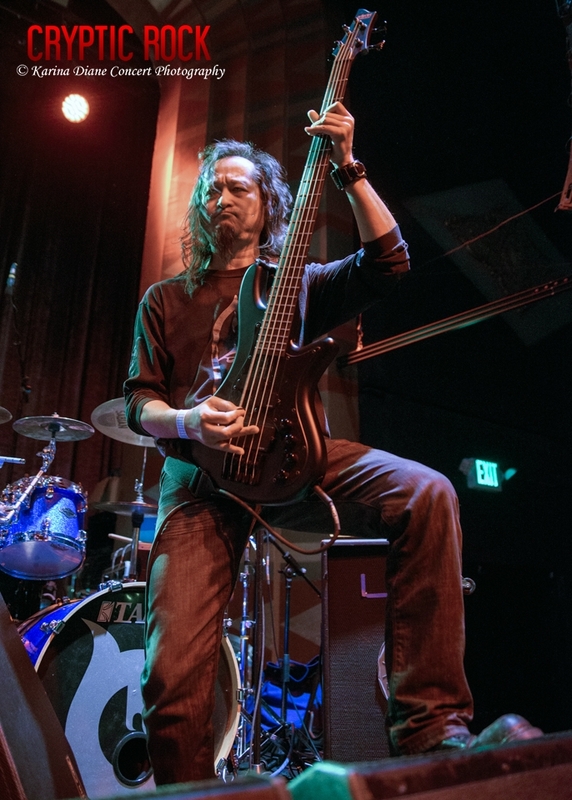 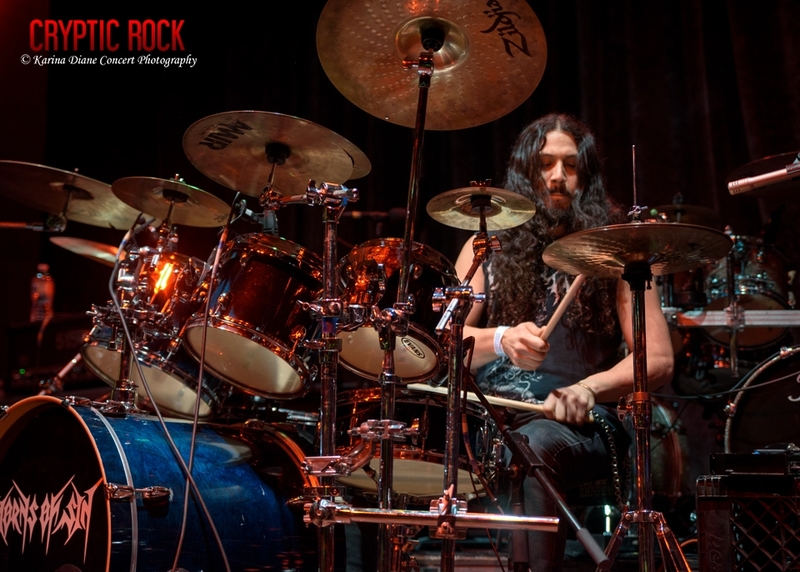 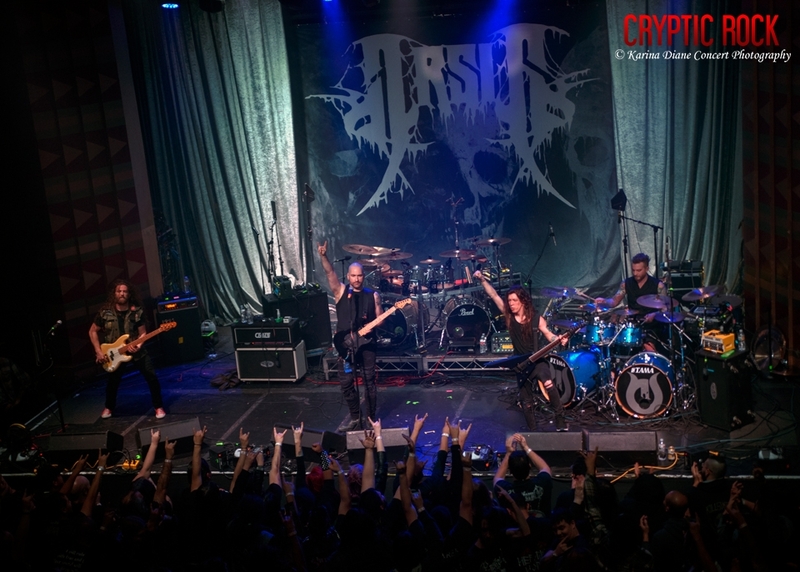 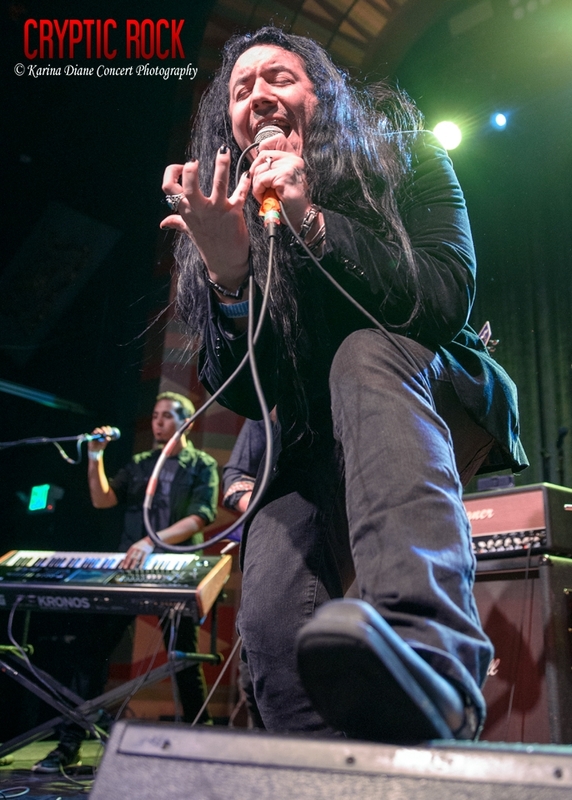 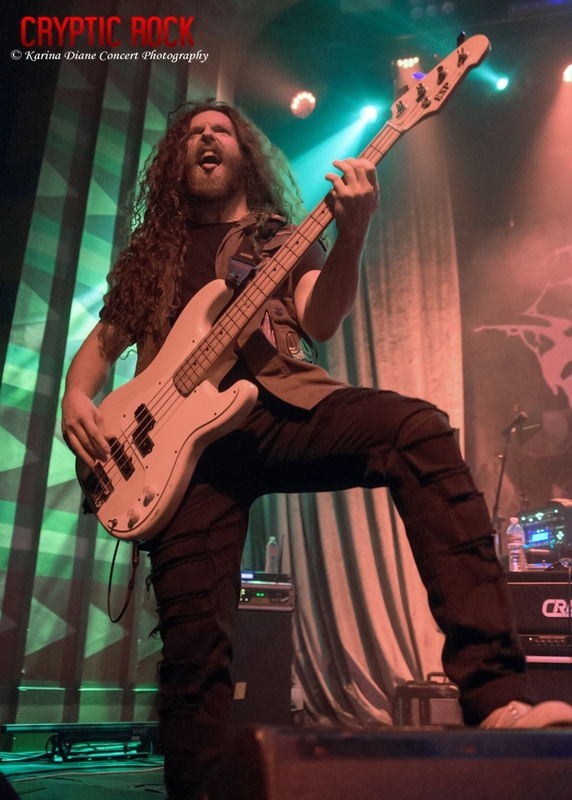 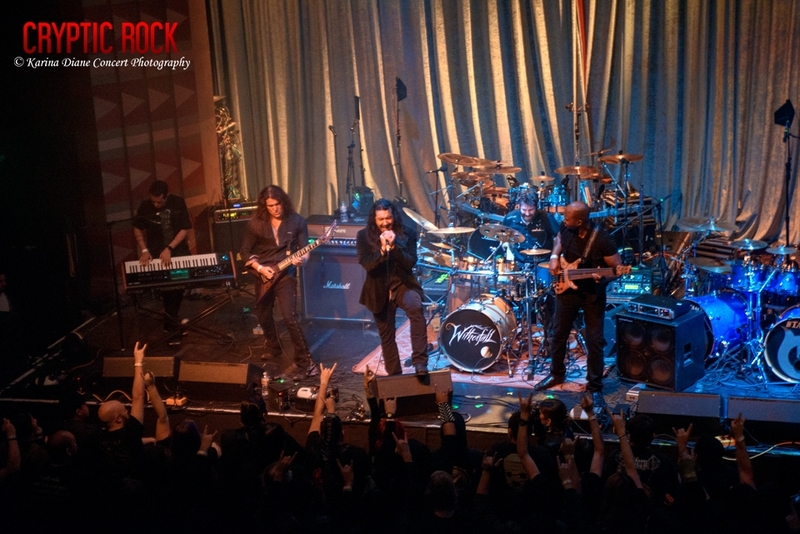 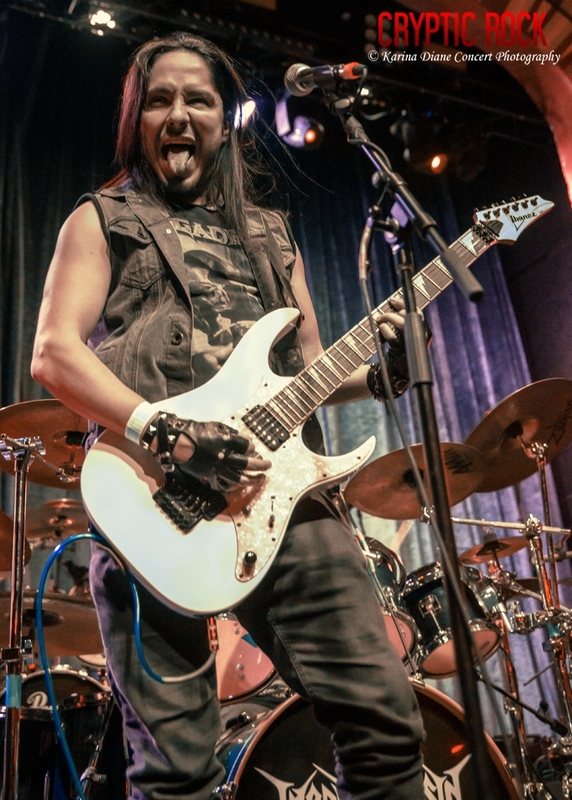 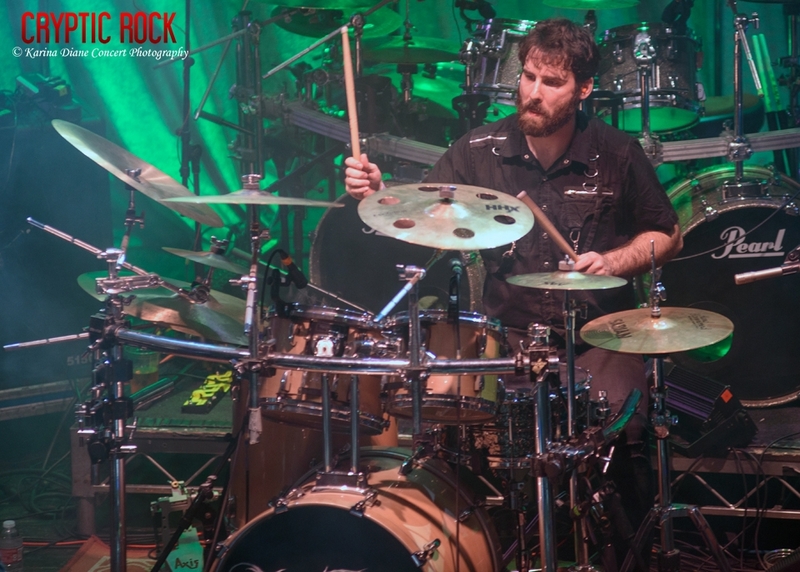 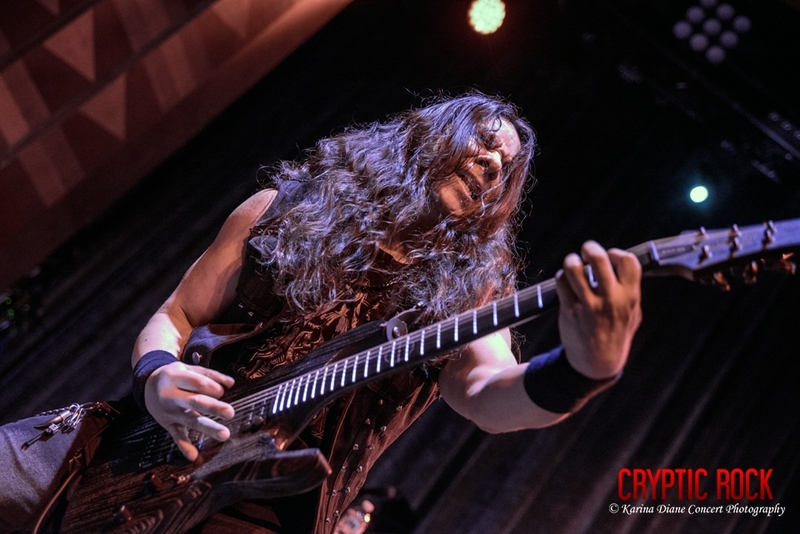 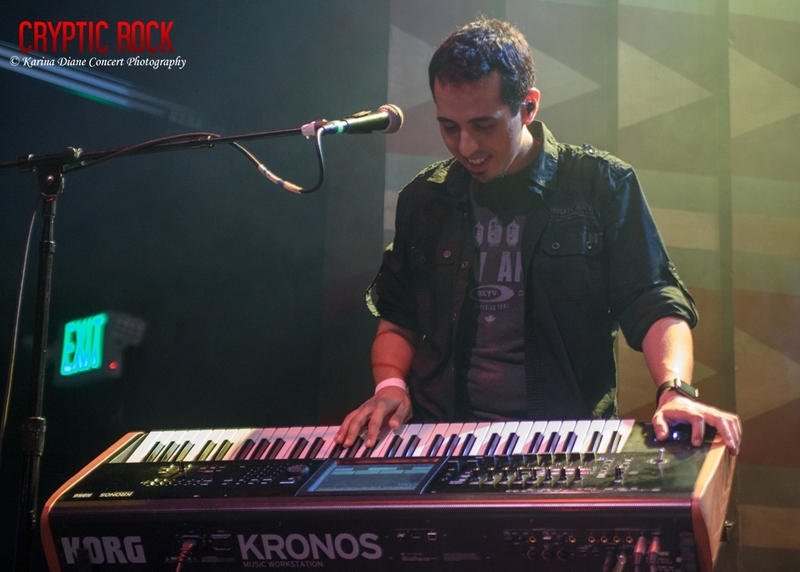 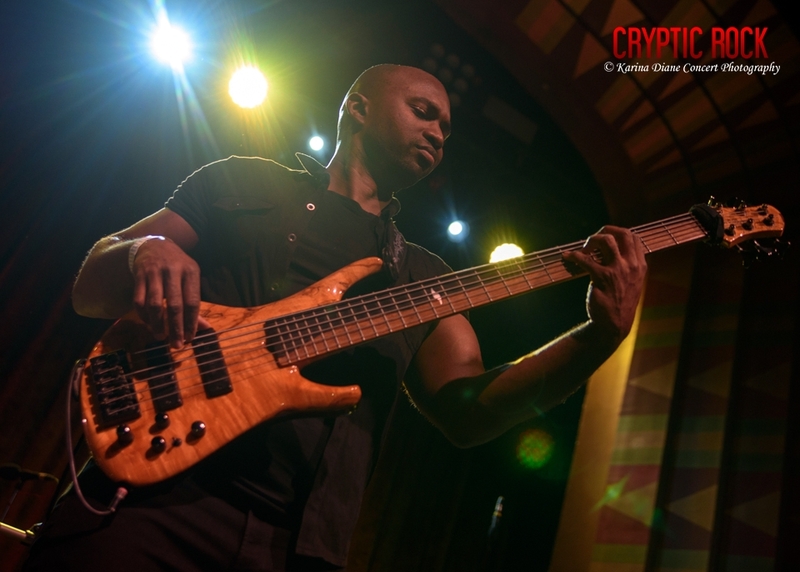 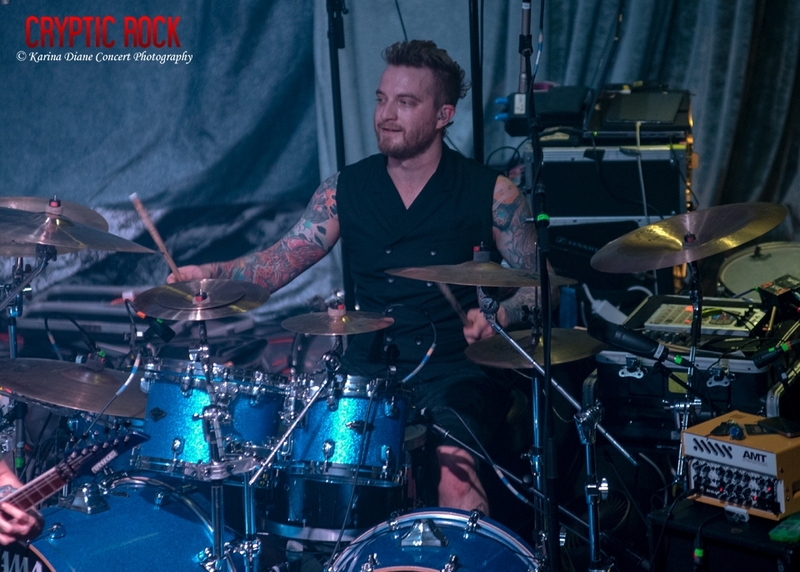 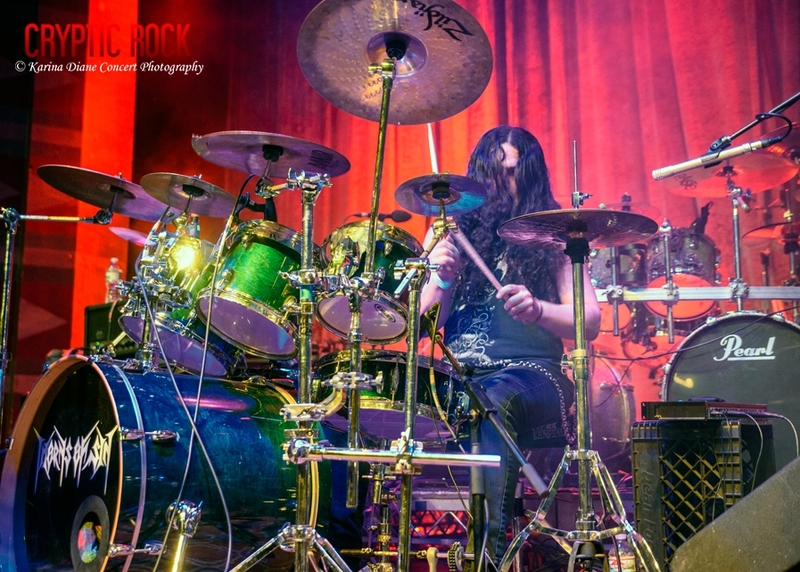 A lineup that was slightly eclectic, a mix of all styles ranging from the darker Death Metal side to varied levels of the melodic sides, it was an evening for the eclectic Metal fans at heart. 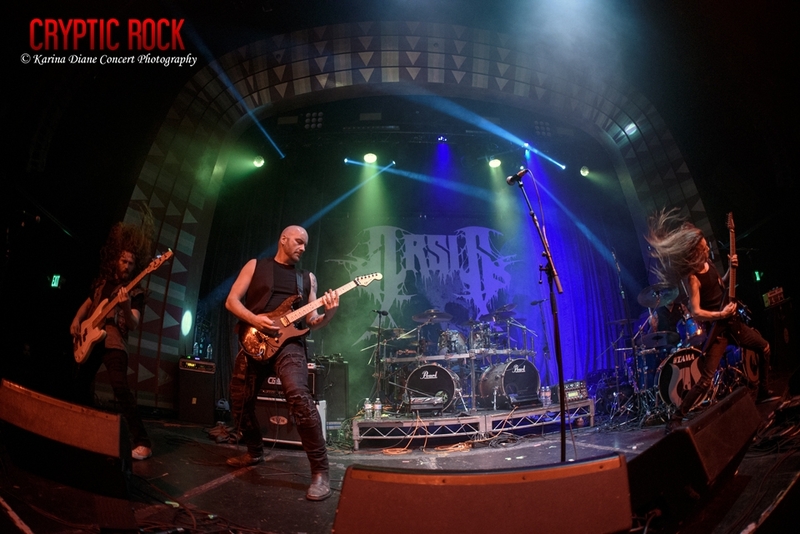 Making a very strong impression on this evening, Los Angeles based melodic Blackened Thrash and Death Metal quartet Thorns Of Sin were up first. 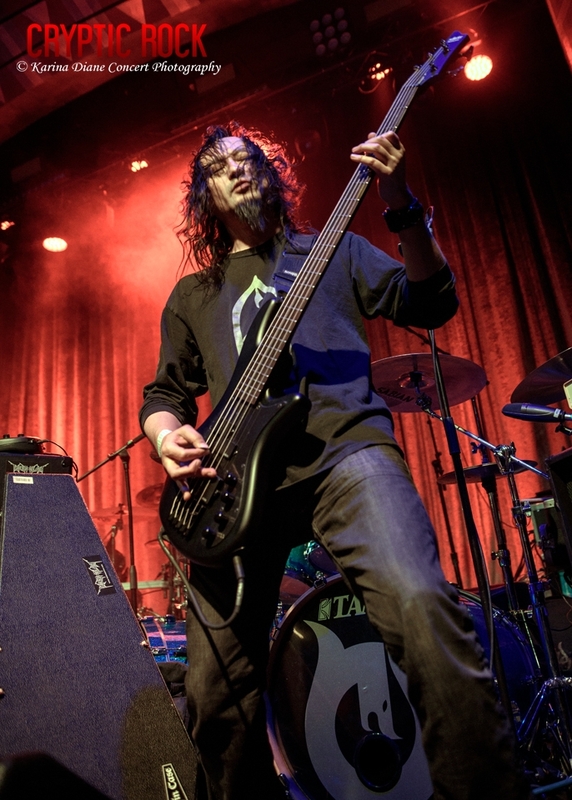 An invention of Lead Vocalist/Guitarist Sergio Varela, playing out since 2015, with a brief hiatus, this would be their first time as a team on the Regent stage. 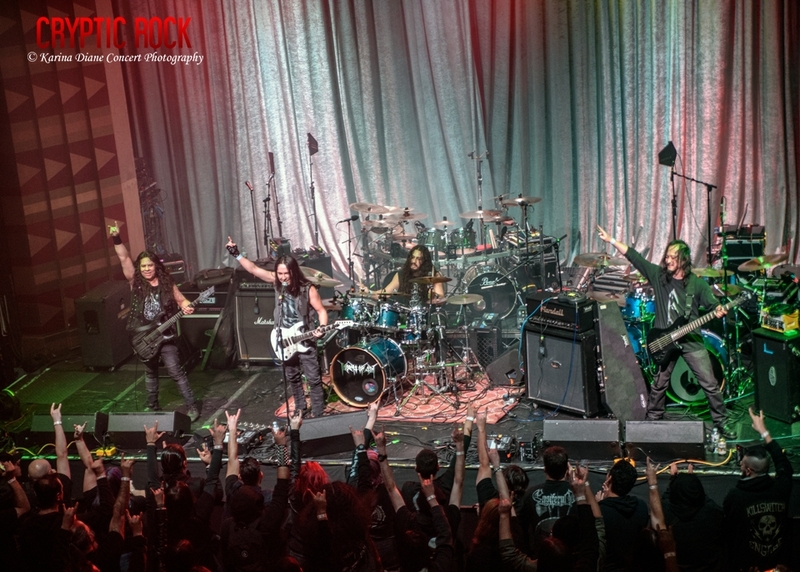 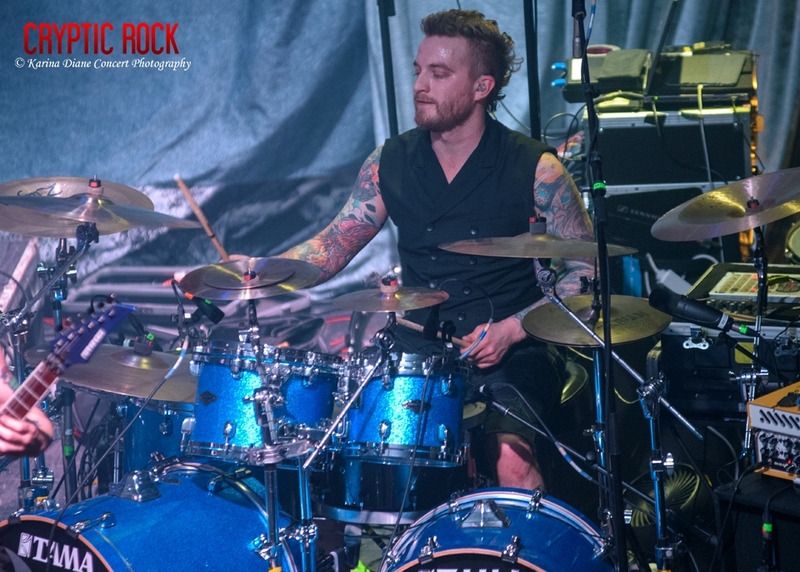 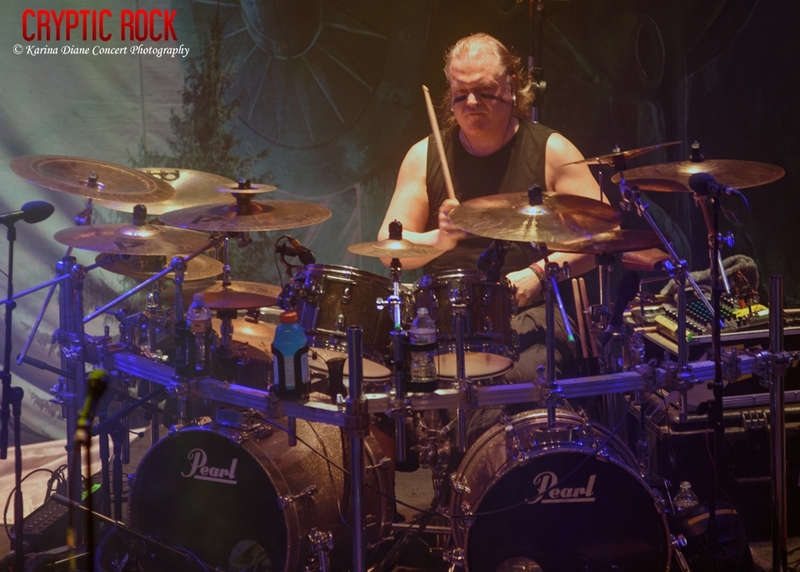 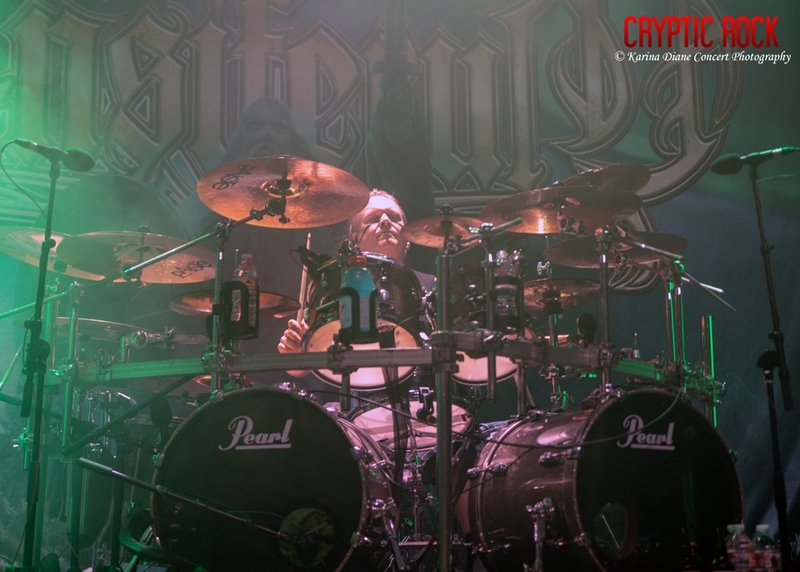 Firing up the audience for what was yet to come, they ended with the powerful “Trapped In The Unknown” that soared fast melodies and creative blast beats out over the sea of satisfied fans. 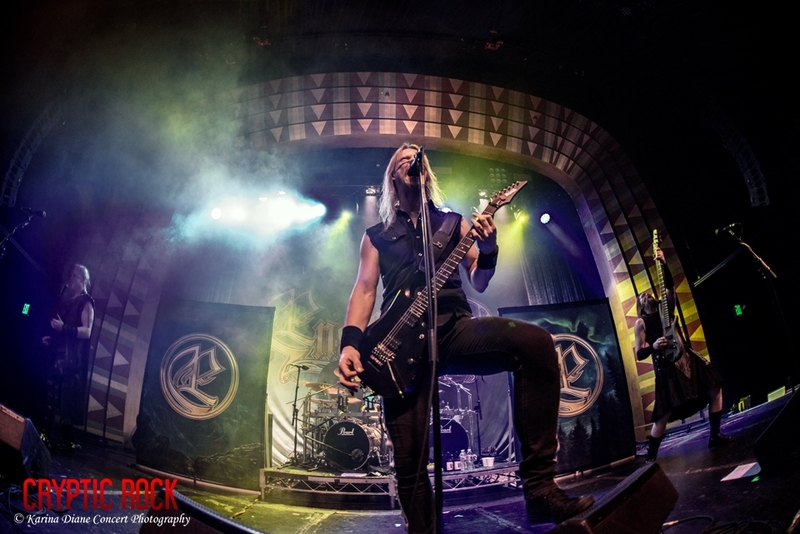 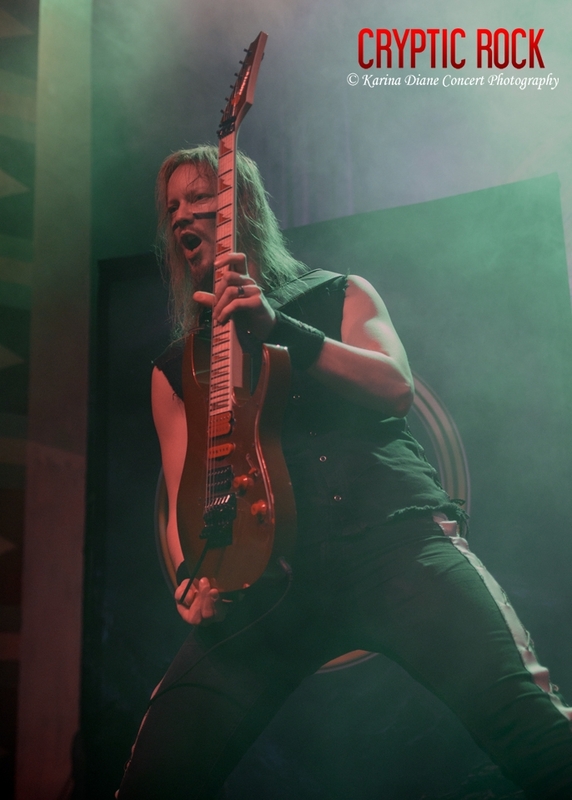 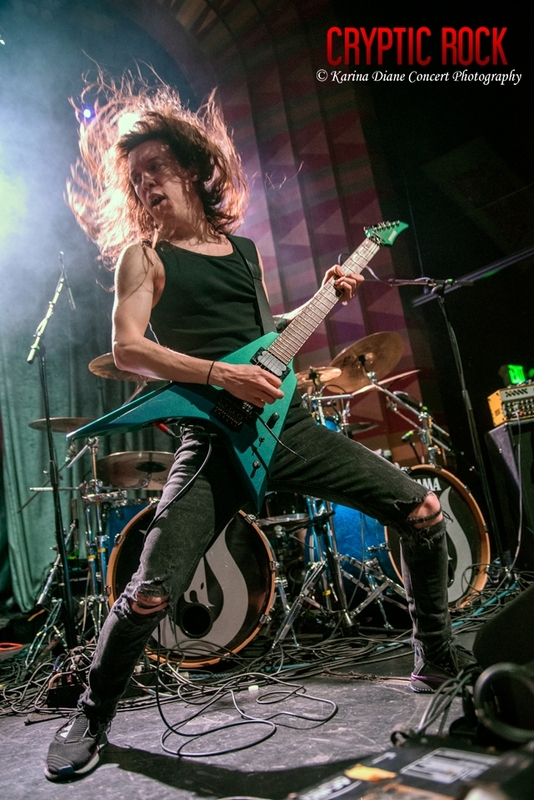 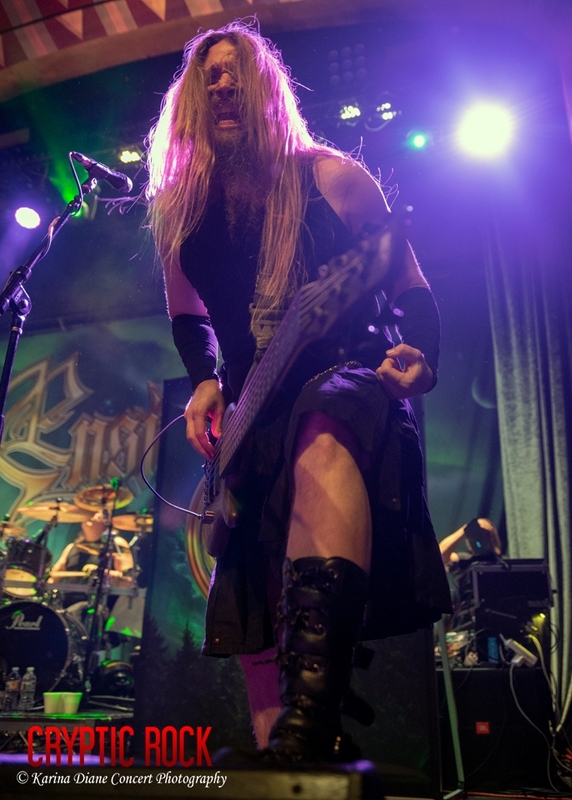 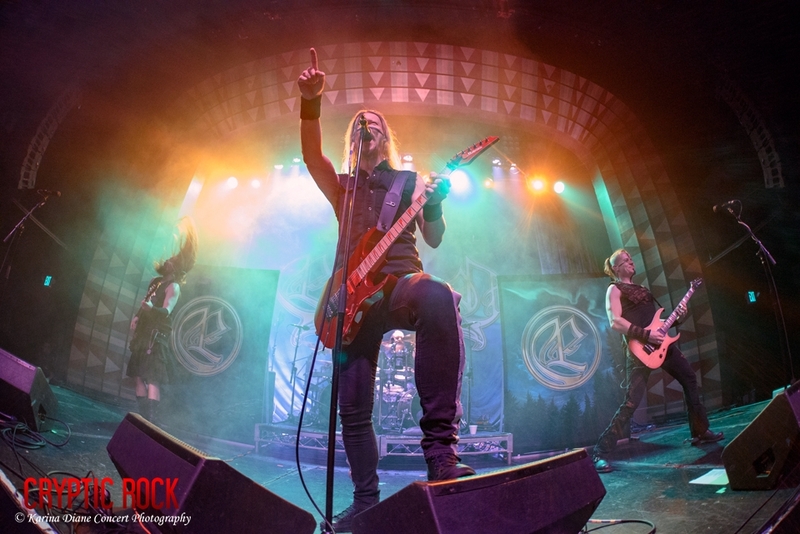 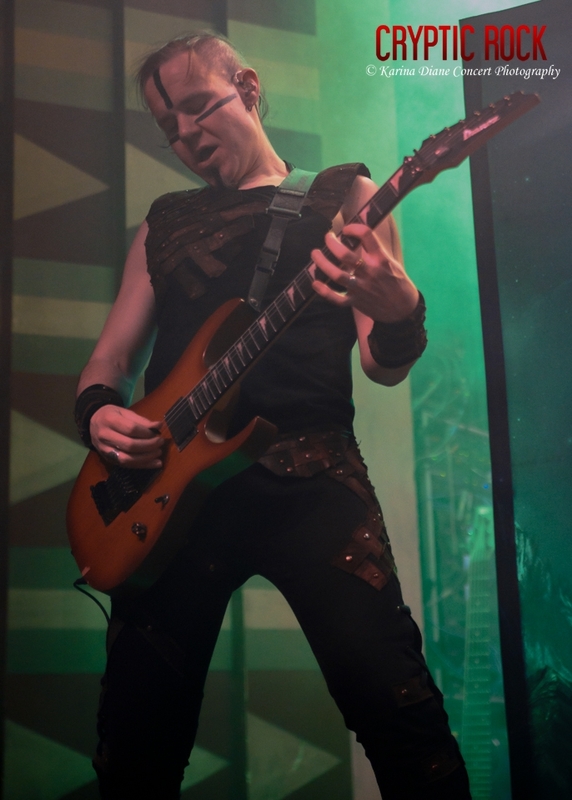 On the bill with Ensiferum proved a worthy fit for them and they would certainly benefit from playing a small tour in Europe with like-minded bands in the future. 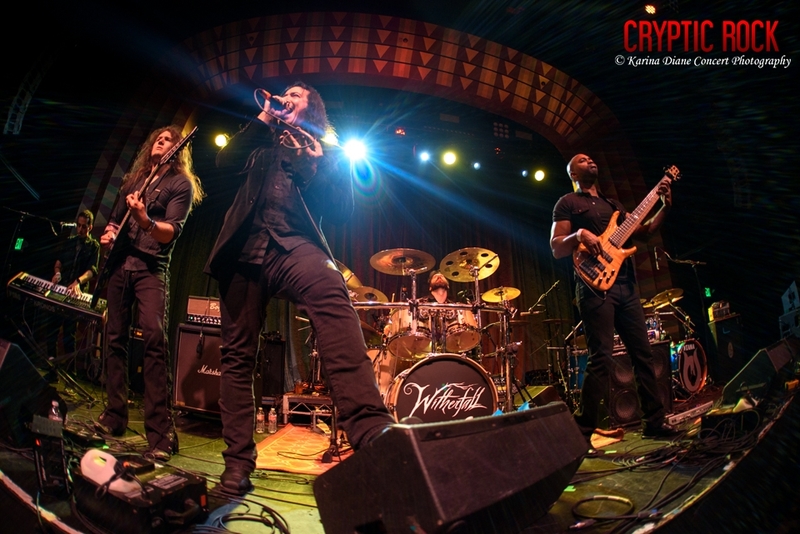 On the other end of the spectrum, another Los Angeles based band, Witherfall, were up next. 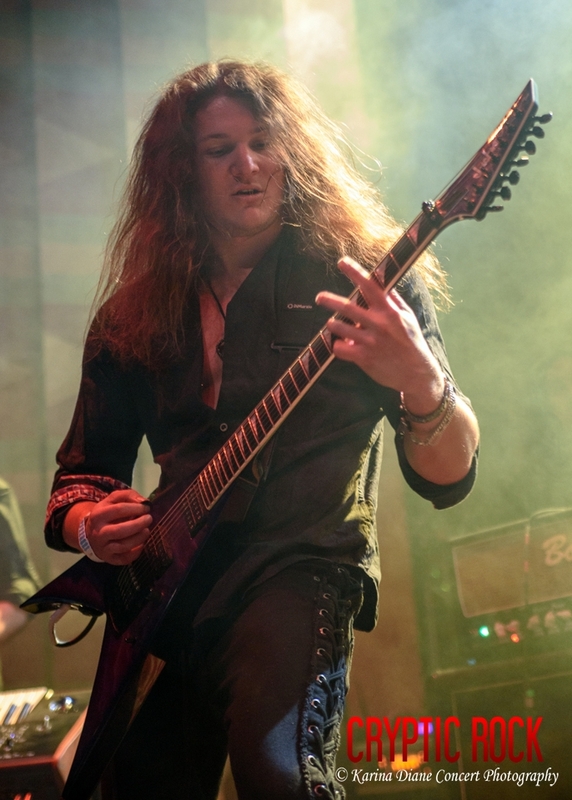 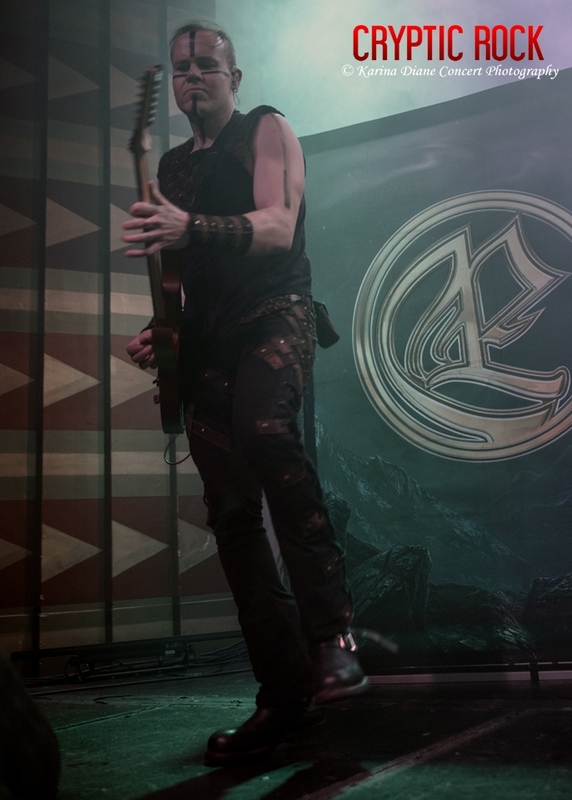 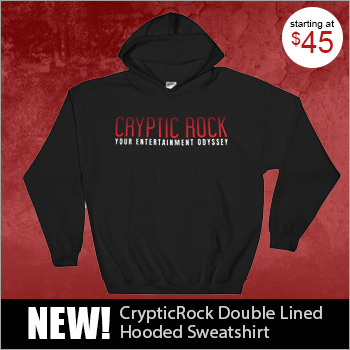 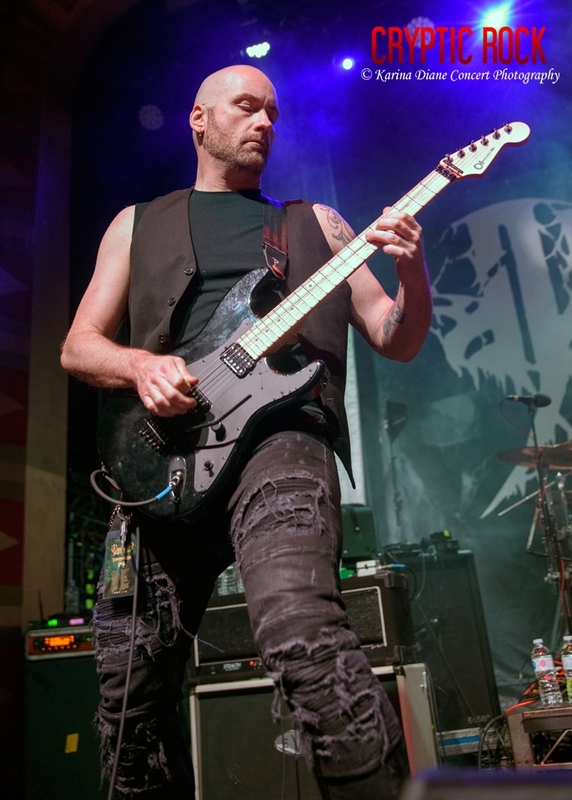 Led by Vocalist Joseph Michael (Sanctuary) and Guitarist Jake Dreyer (Iced Earth) danced into spot with their melodic brand of Metal that covers a range of genres as well. 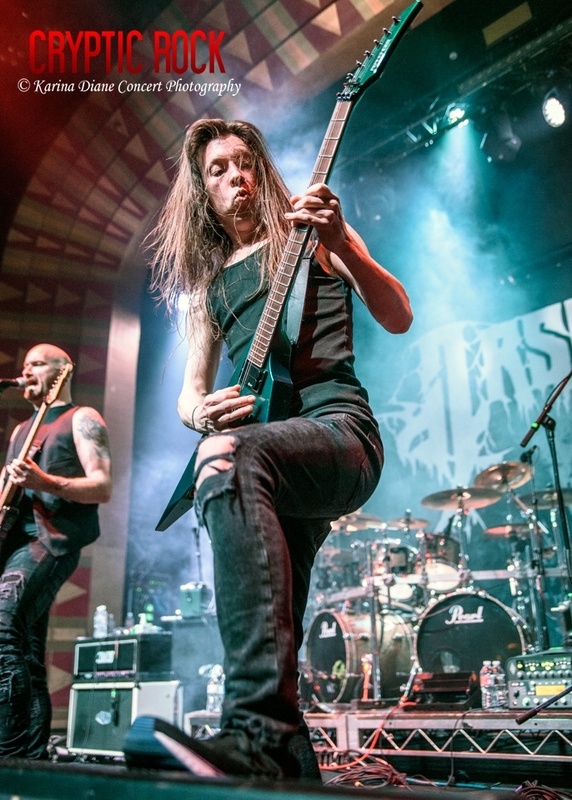 Also their first Regent show, as well as it being their first US show since they toured Europe plus 70,000 Tons Of Metal thus far, there was a sense of excitement in the air. 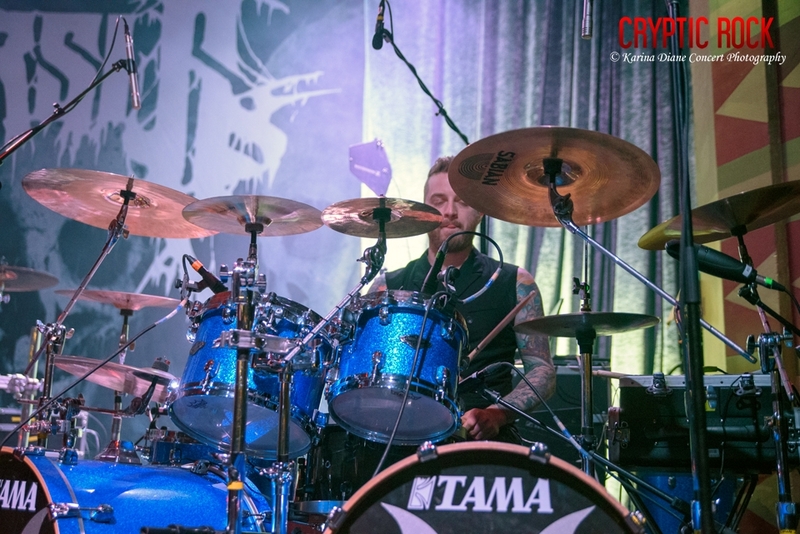 Active since 2013, after the unfortunate death of past Drummer Adam Sagan, they were inspired to write the very somber album, A Prelude To Sorrow. Released last November as their second LP, it speaks from the heart on the fragile aspect of life. 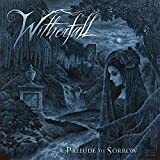 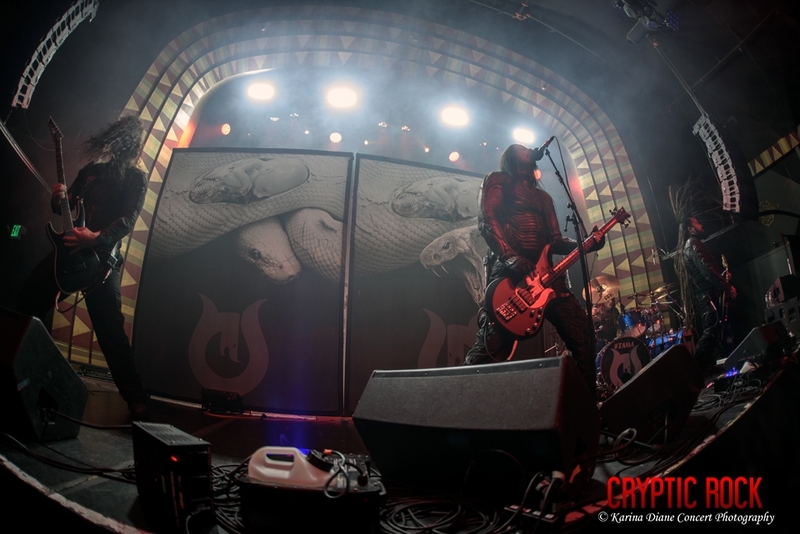 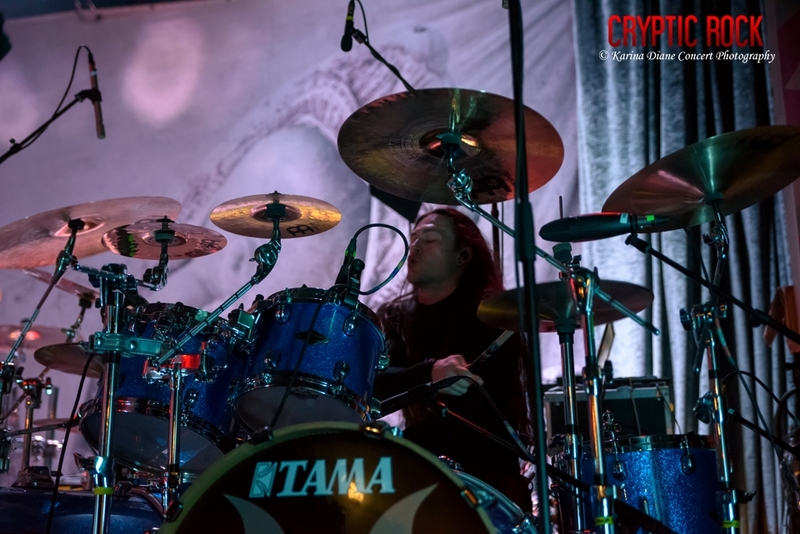 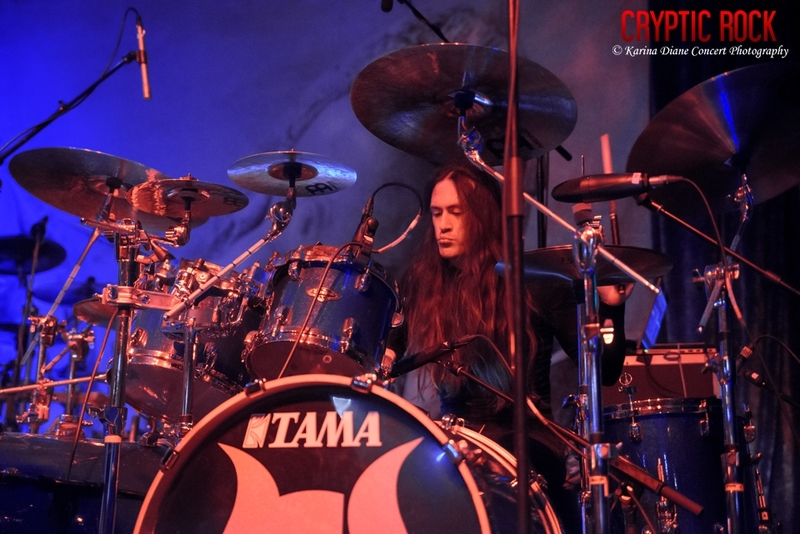 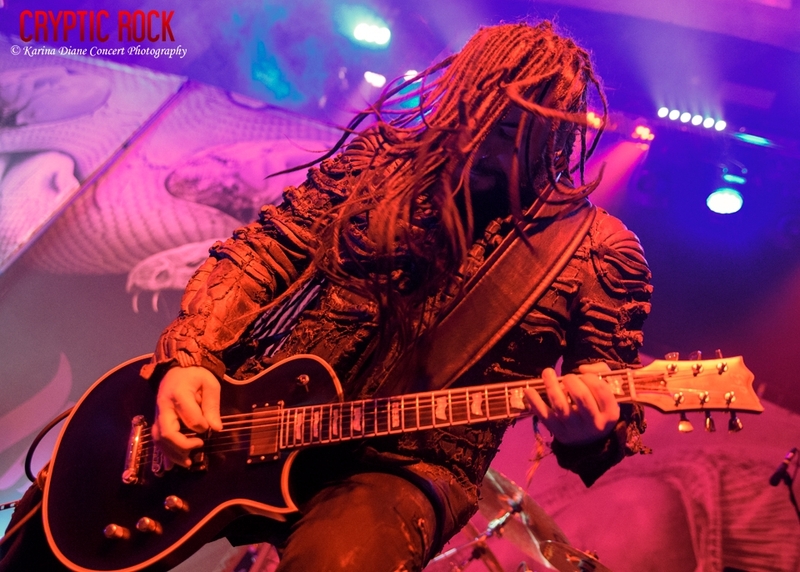 With this music in hand, although Witherfall had commonalities in genre with the surrounding bands on the bill, their uprooting in traditional Metal may have thrown off a few of the Septicflesh fans. 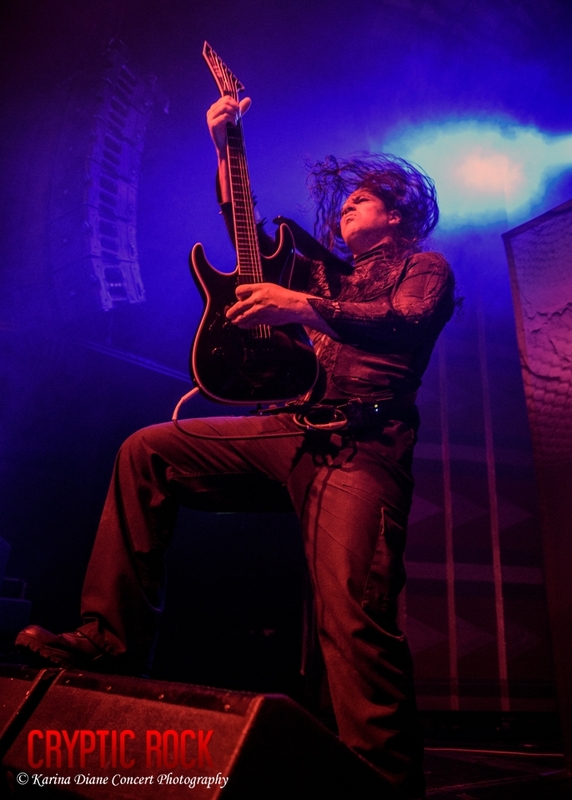 Nonetheless, the melodies and prodigal vocals of Michael matched with highly saturated guitar riffs of Dreyer swelled the void nicely. 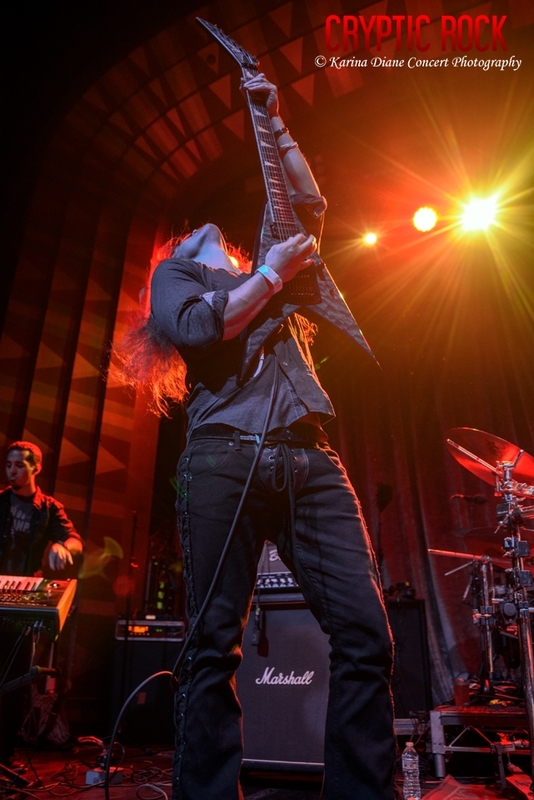 As far as opening acts are considered, for shows like this, they both brought their A-game and launched it into a well above average turnout. 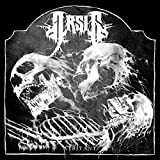 The next adventure to be had came with Virginia based Melodic Death Metal act Arsis. 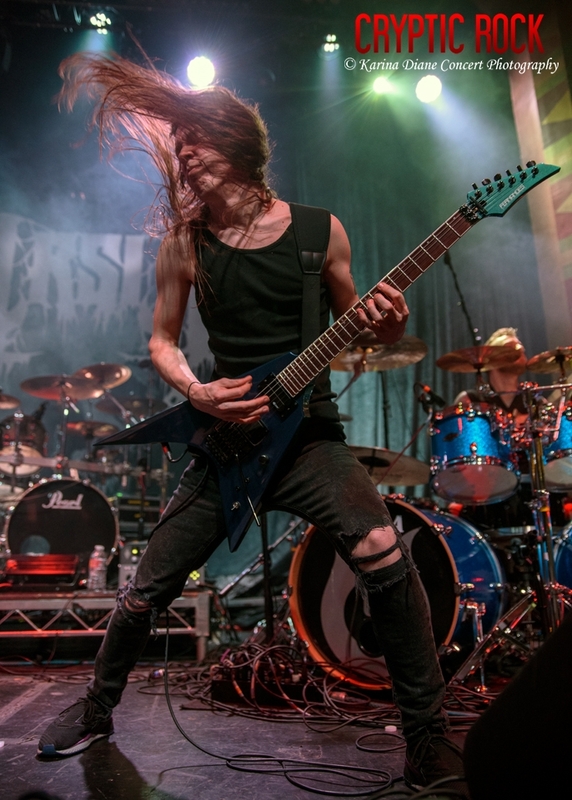 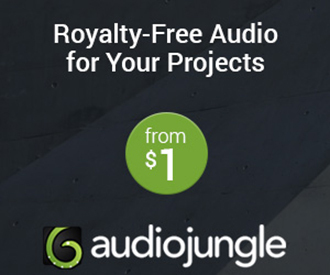 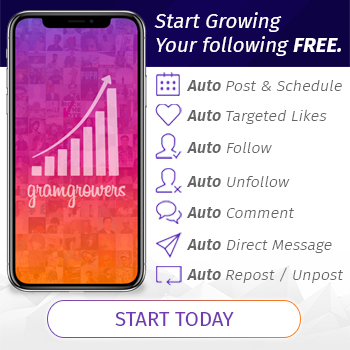 Throwing in a valiant effort to please some elitist fans of the genre, simply put, they have their own ideals when it comes to the genre as well as they tend to mix in some technical, symphonic, and even Metalcore methods. 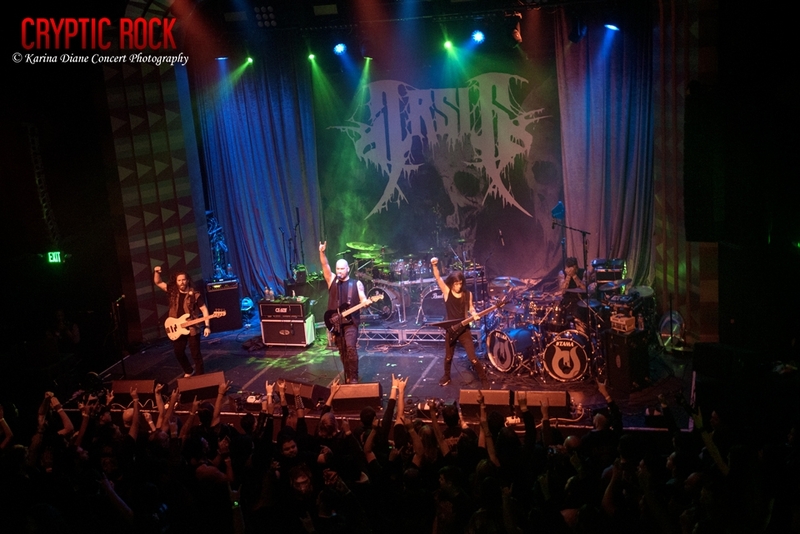 Evoking a chaotic whirlwind on stage, Arsis’ set was in full effect. 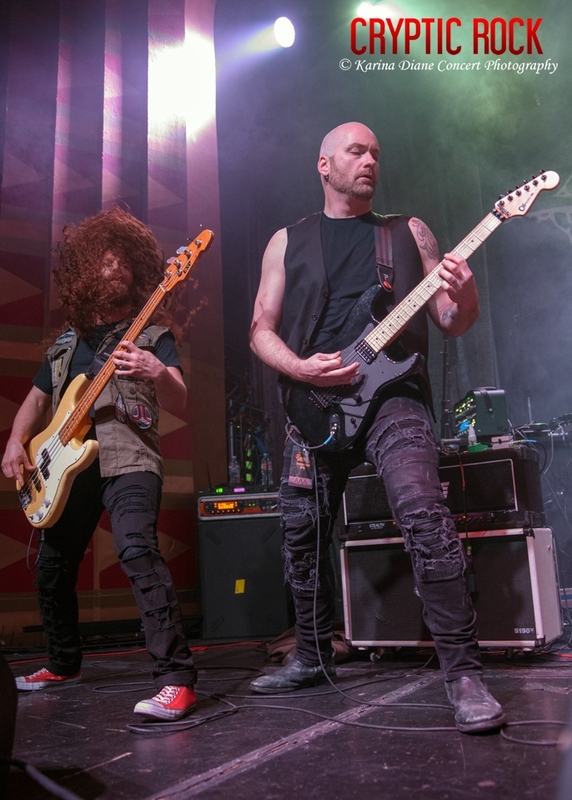 With six studio albums out since their formation in 2000, their most recent last year’s Visitant, they set off the night with a variety of heavy tunes impacting all their fans in the room. 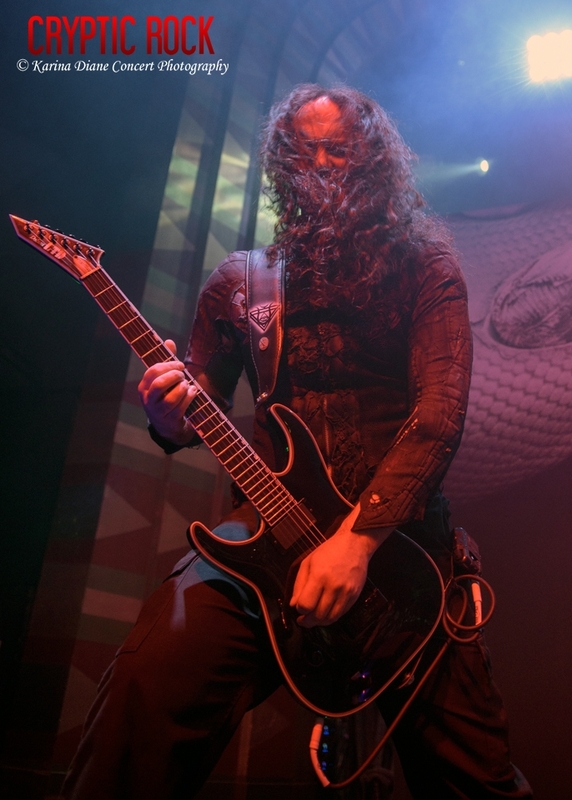 Playing as the venue increasingly packed up, the mosh pit was also increasingly brutal. 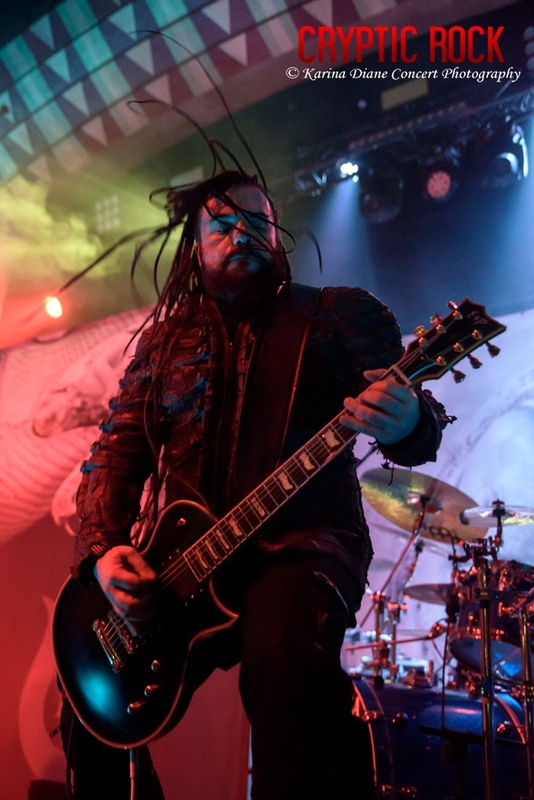 Even most impressive, while they played a set that was not super long, they managed to cover a vast range of their material with out missing much. 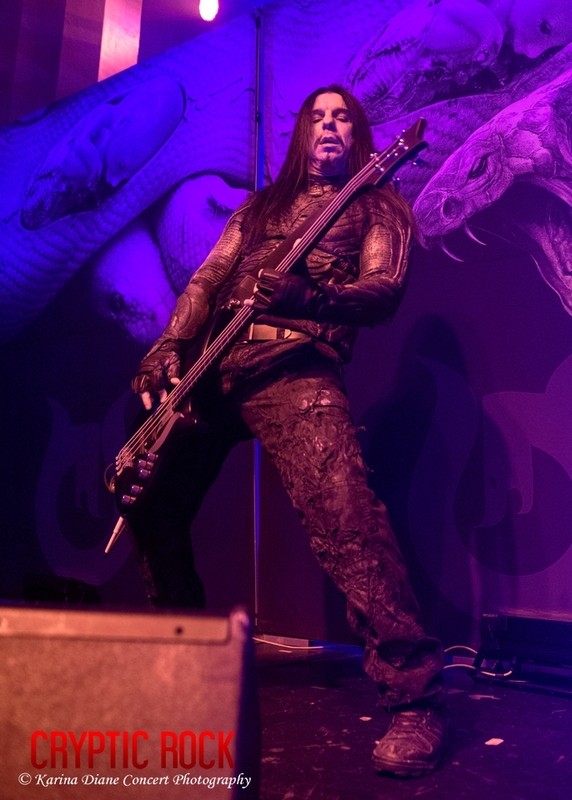 On to what many fans were calling the highlight of the night, Greece’s Septicflesh took over the stage in a fashion only they are capable of. 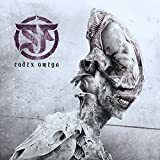 Bringing with them their latest album, 2017’s Codex Omega, artwork encompassing the backdrops, the deep shadows of the lighting against their very Metal style black textured Sci-Fi warrior apparel sent the message that the band was serious business. 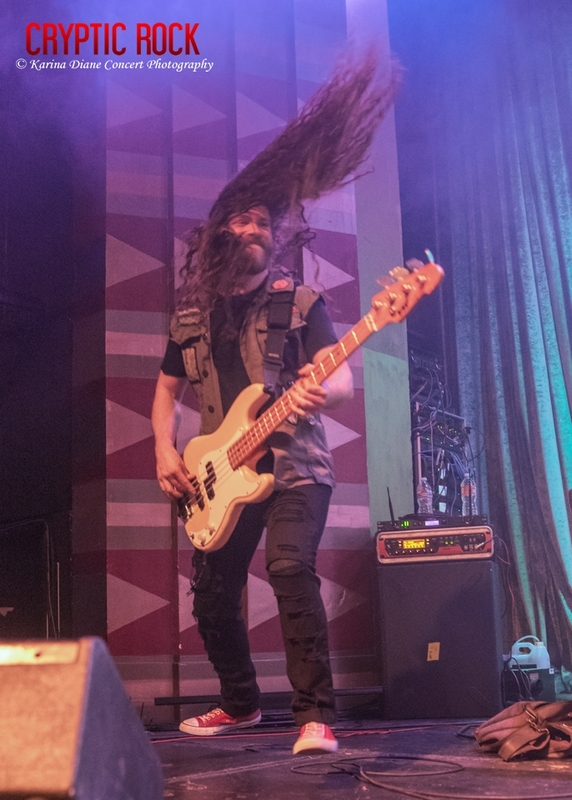 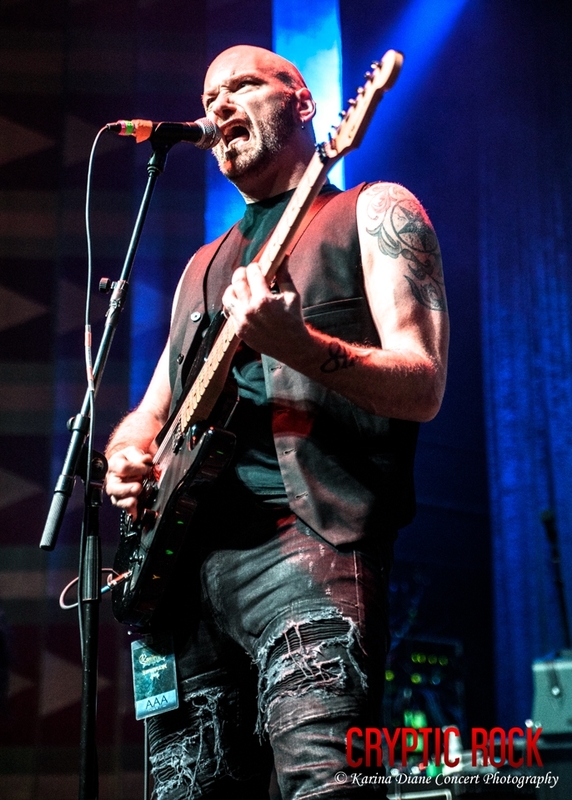 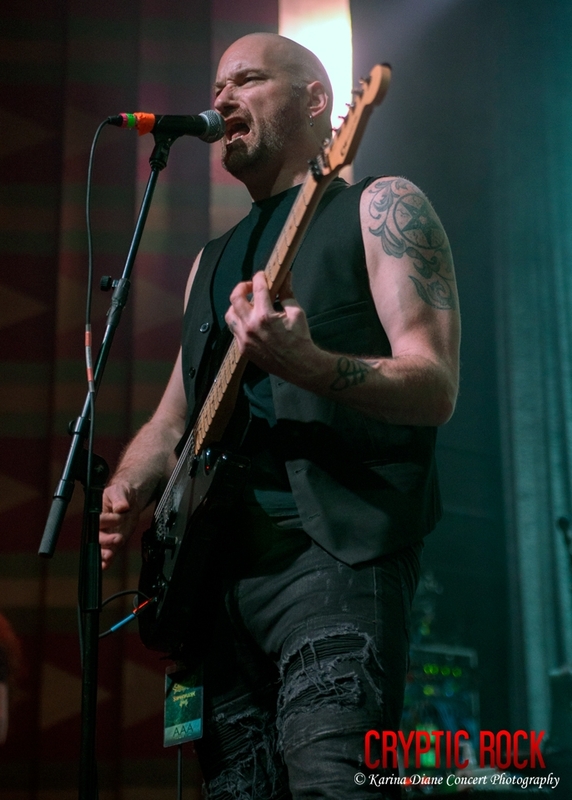 Led by Frontman and Bassist Spiros Antoniou, the talented artist was very energetic and charming with his banter, trying to get the crowd to go wild in the pit despite his lack of fluent English. 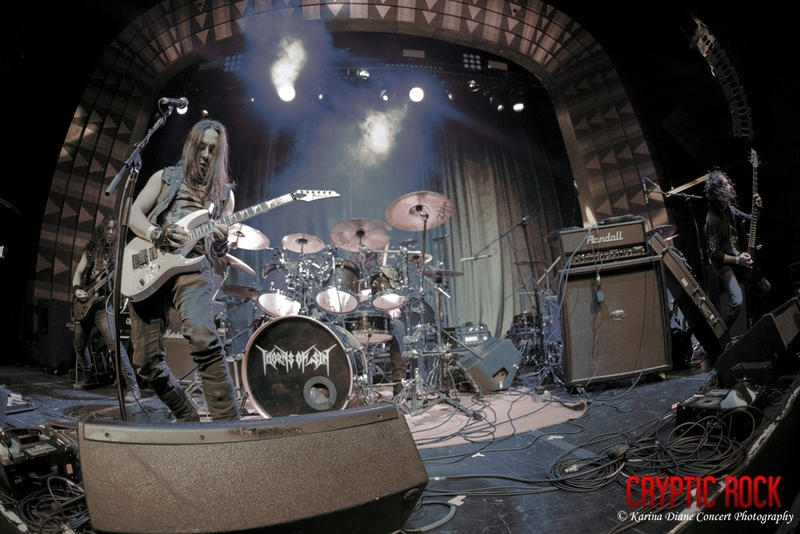 The rest of his team, consisting of Sotiris Vayenas (rhythm guitar/ clean vocals/ keyboards), Christos Antoniou (lead guitar/ orchestrations/ samples), and powerhouse Kerim “Krimh” Lechner (drums) round out the uniqueness of their Symphonic Melodic Death Metal sound nicely. 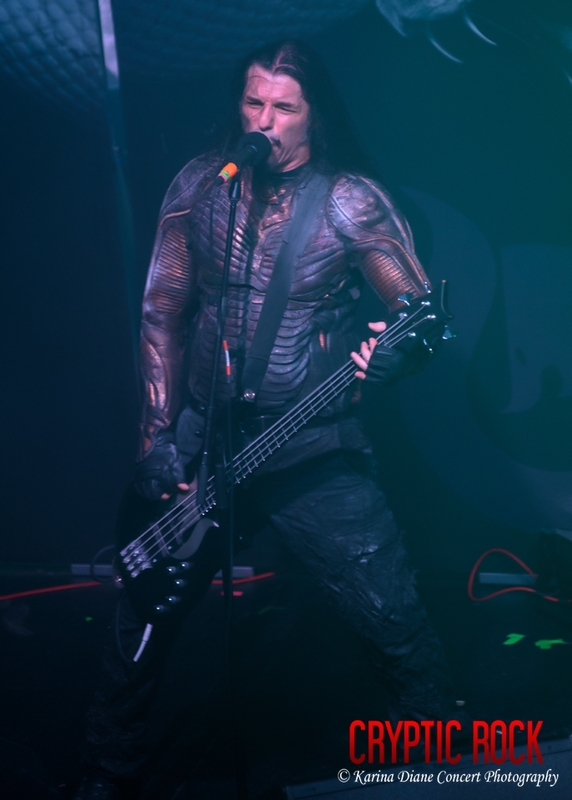 Recently touring the North American region last year at the same Los Angeles location with Dark Funeral, a similar setlist and energy was repeated, yet no one seemed to mind. 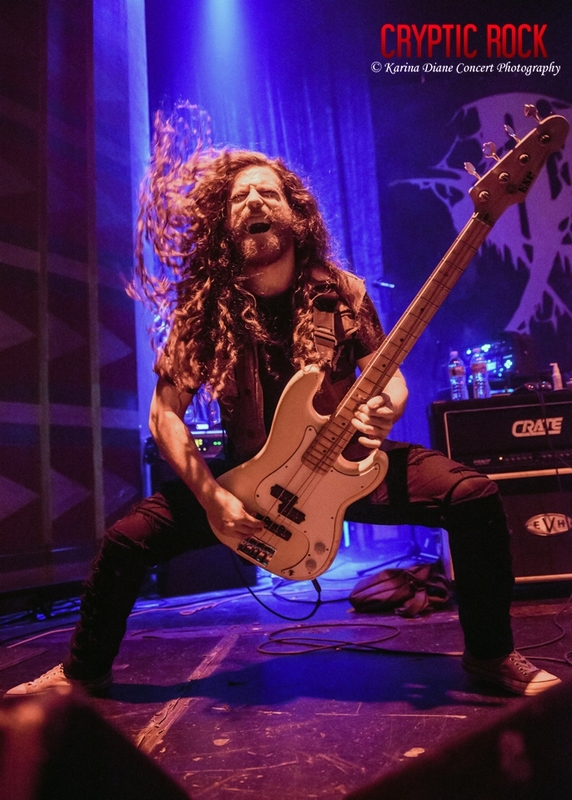 In truth, Greece seems to sell a particular vibe of Heavy Metal that resonates in an awe-inspiring way no matter how many times it is witnessed. 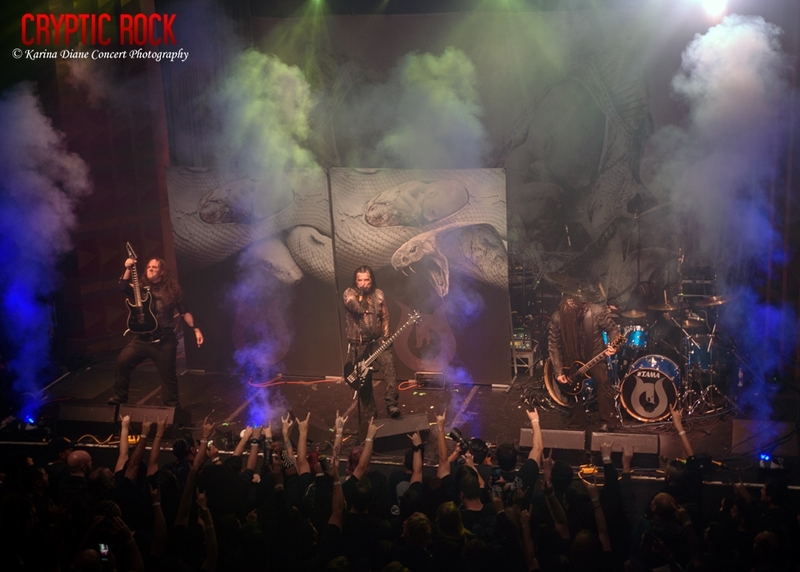 As their brethren from Greece, Rotting Christ seems to take on the same effect, even though the bands are each their own in sound and agenda, this crowd was completely engaged with the perform. 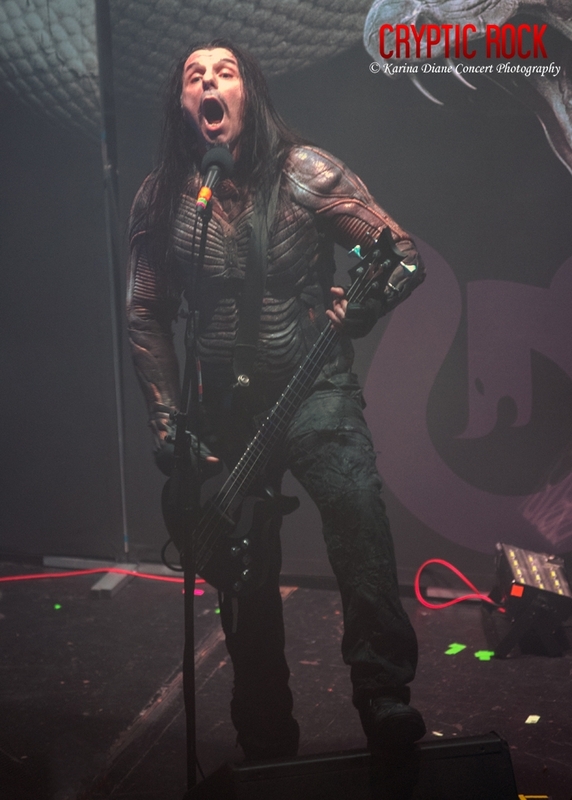 Concentrating primarily on their newest brutality, the aforementioned Codex Omega, they shot out four songs from the album such as “Portrait Of Headless Man” and “Dark Art.” Additionally, older album highlights included “Pyramid God” and “Anubis.” All in all, Septicflesh once again dominated in their return to Los Angeles with their unique brand of Metal. 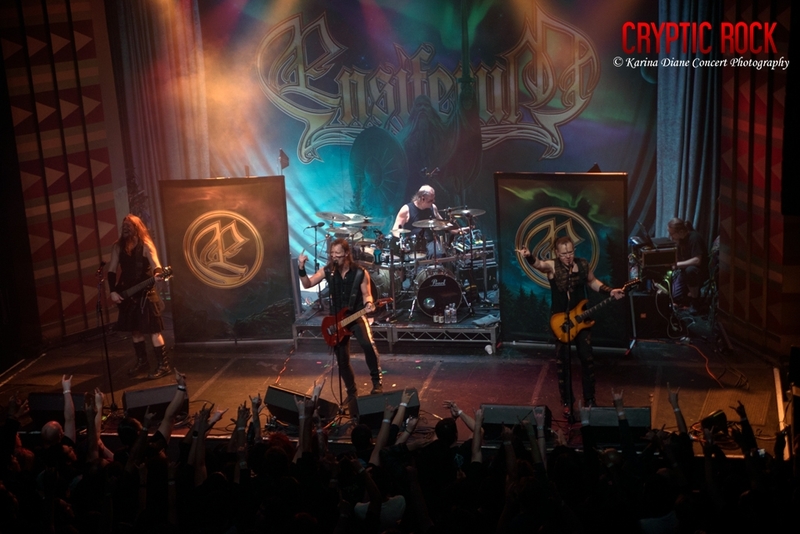 Reaching the final stretch of the evening’s entertainment, the crowd anxiously awaited for Ensiferum. 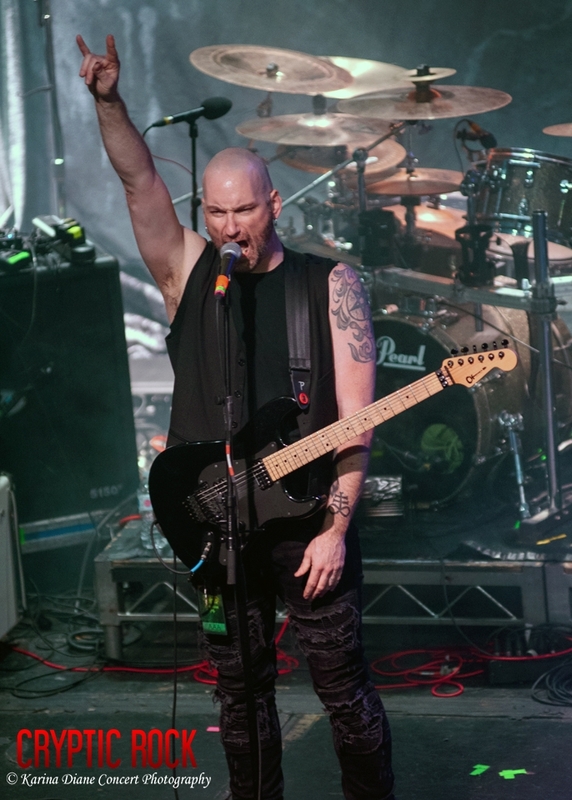 The time had come for these rightful headliners, and perhaps it was their most heavily excitingly energetic perform in the USA to date. 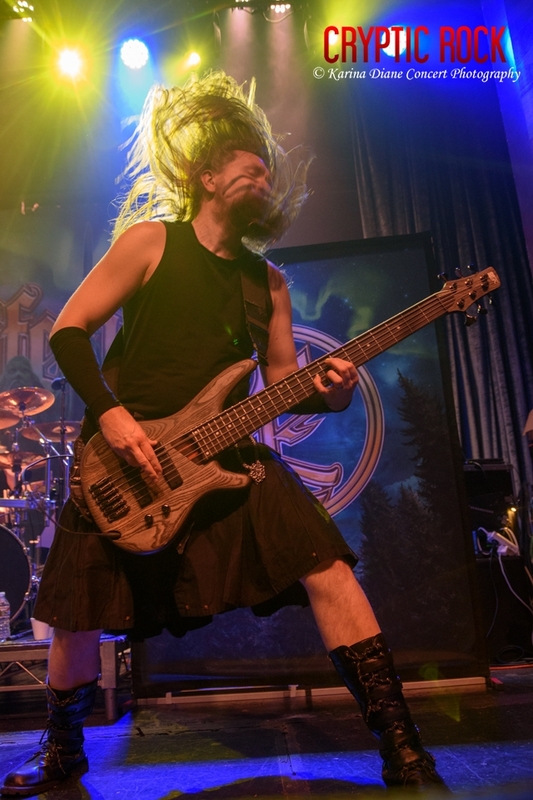 Known as a Folk Metal band primarily, they usually get lumped in with the like-minded Eluveitie or Korpiklaani, who tend to be a bit on the calmer side of the Metal spectrum. 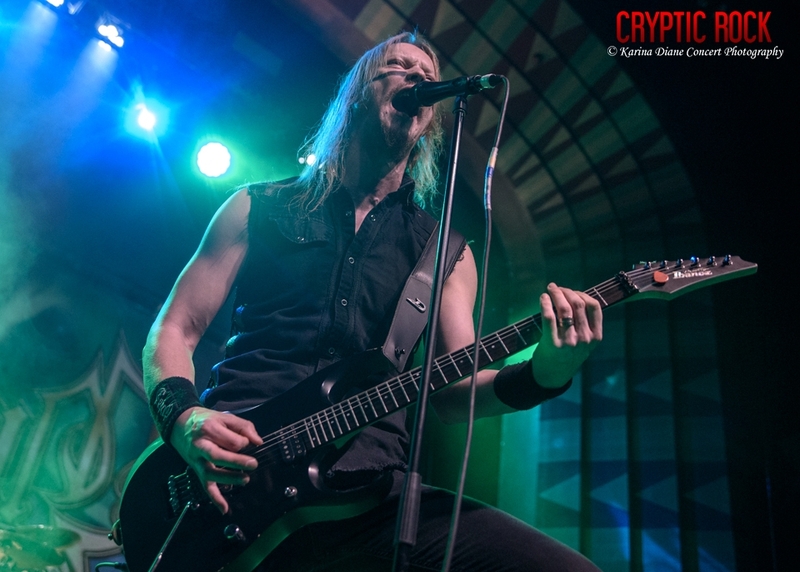 One of the original Folk Metal bands from the European corner of the Earth, Ensiferum are another band whose latest album was released in 2017, Two Paths, so naturally it was one of the most focused portions of the show. 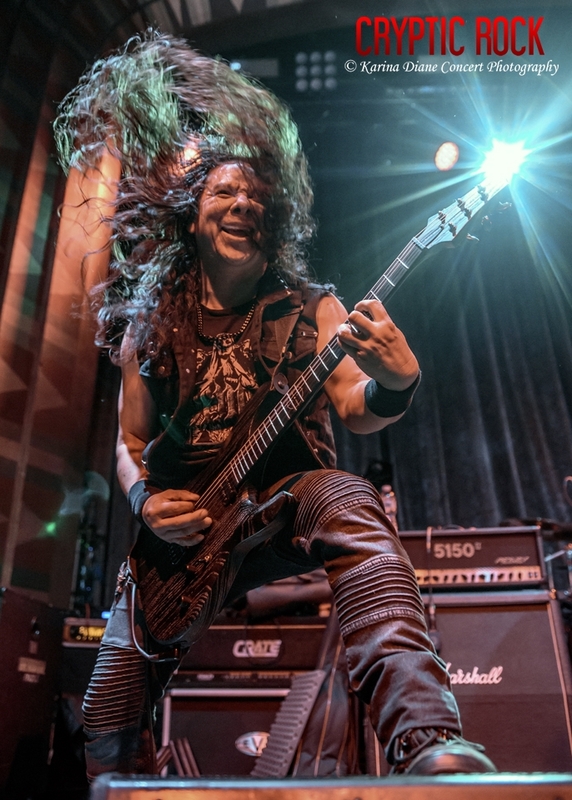 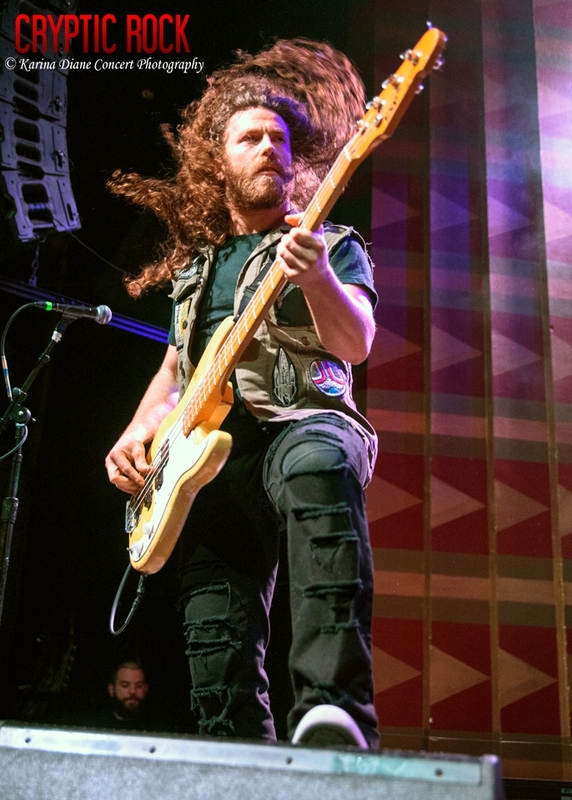 Concentrating on the tunes from that record, including the title-track, “Two Paths,” which came in after the popular “For Those About To Fight For Metal,” they also weighed in heavily with their 2015 album, One Man Army, with “Heathen Horde,” among others. 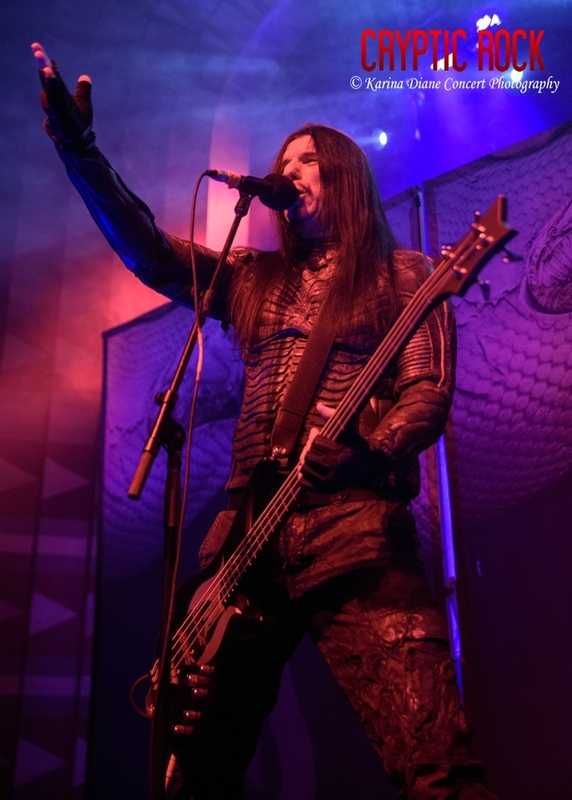 Observing the room, it was evident that a few spectators preferred either Ensiferum or Septicflesh, and while these select few did not necessarily dedicate their allegiance to both, the combination was exciting as well as curious to most. 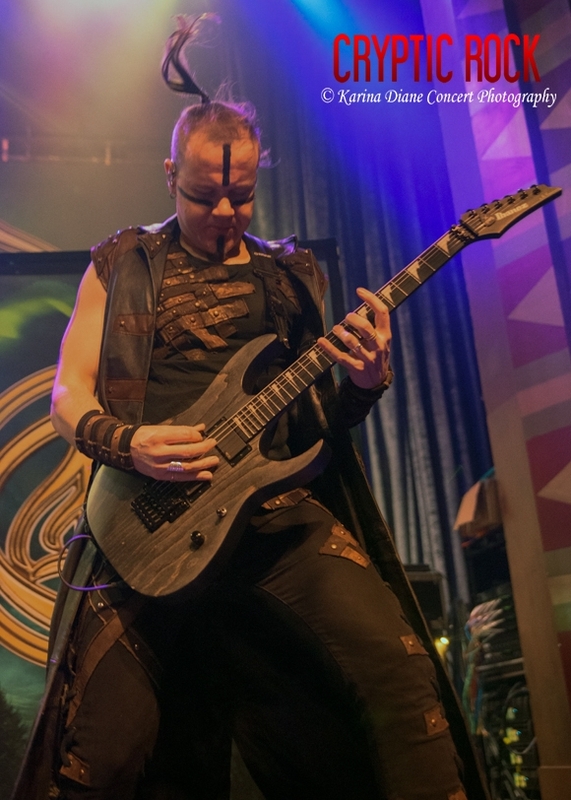 With Ensiferum, they rely heavily on the keyboard sounds and Folk elements, which are always quite exotic, yet dynamic. 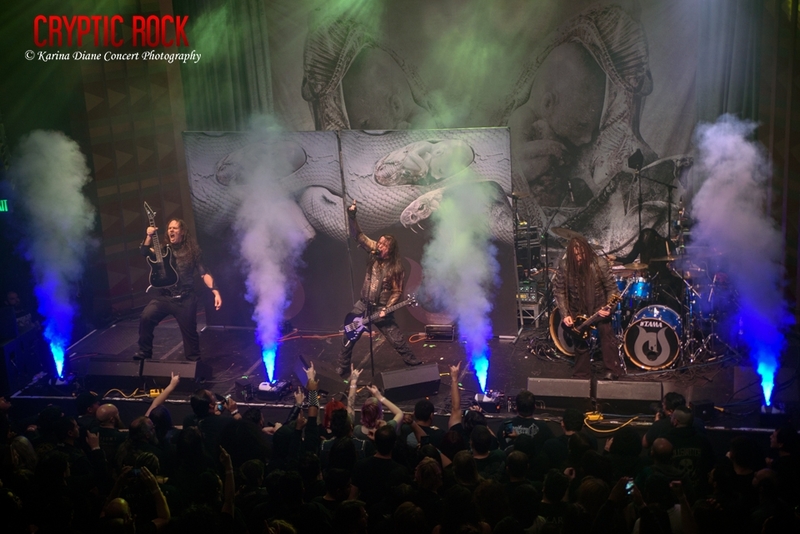 Matching their sound, the black stripe Viking war paint they wear is specialized and fitting for their presentation. 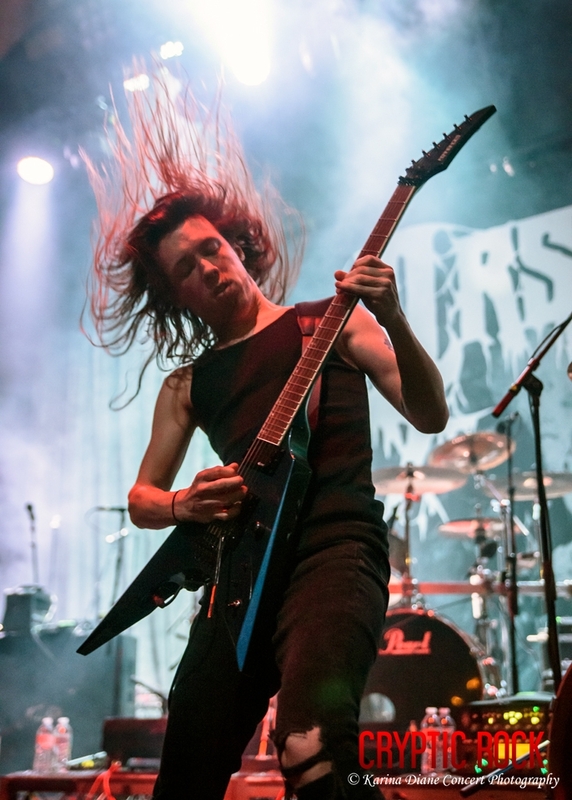 Really grinding the gears, they mix in a cleaner variety of the Death Metal sounds that really succeeds with Janne Parviainen’s creative and fast drumming along with the intertwining of clean vocals (Markus Toivonen, Sami Hinkka) along with the harsh vocals (Petri Lindroos) which mingle with the guitars brilliantly.